Indonesia (/ˌɪndəˈniːʒə/ ( listen) IN-də-NEE-zhə, /-ˈniːziə/ -⁠NEE-zee-ə; Indonesian: [ɪndoˈnesia]), officially the Republic of Indonesia (Indonesian: Republik Indonesia [reˈpublik ɪndoˈnesia]), is a country in Southeast Asia, between the Indian and Pacific oceans. It is the world's largest island country, with more than seventeen thousand islands, and at 1,904,569 square kilometres (735,358 square miles), the 14th largest by land area and the 7th largest in combined sea and land area. With over 261 million people, it is the world's 4th most populous country as well as the most populous Muslim-majority country. Java, the world's most populous island, is home to more than half of the country's population. The sovereign state is a presidential, constitutional republic with an elected parliament. It has 34 provinces, of which five have special status. Jakarta, the country's capital, is the second most populous urban area in the world. The country shares land borders with Papua New Guinea, East Timor, and the eastern part of Malaysia. Other neighbouring countries include Singapore, Vietnam, the Philippines, Australia, Palau, and India's Andaman and Nicobar Islands. Despite its large population and densely populated regions, Indonesia has vast areas of wilderness that support a high level of biodiversity. The country has abundant natural resources like oil and natural gas, tin, copper and gold. Agriculture mainly produces rice, palm oil, tea, coffee, cacao, medicinal plants, spices and rubber. Indonesia's major trading partners are China, United States, Japan, Singapore and India. The history of the Indonesian archipelago has been influenced by foreign powers drawn to its natural resources. It has been an important region for trade since at least the 7th century, when Srivijaya and then later Majapahit traded with entities from mainland China and the Indian subcontinent. Local rulers gradually absorbed foreign cultural, religious and political models from the early centuries and Hindu and Buddhist kingdoms flourished. Muslim traders and Sufi scholars brought Islam, while European powers brought Christianity and fought one another to monopolise trade in the Spice Islands of Maluku during the Age of Discovery. Although sometimes interrupted by the Portuguese, French and British, the Dutch were the foremost European power for much of its 350-year presence in the archipelago. In early 20th century, the concept of "Indonesia" as a nation state emerged, and independence movements began to take shape. During the decolonisation of Asia after World War II, Indonesia achieved independence in 1949 following an armed and diplomatic conflict with the Netherlands. Indonesia consists of hundreds of distinct native ethnic and linguistic groups, with the largest—and politically dominant—ethnic group being the Javanese. A shared identity has developed, defined by a national language, ethnic diversity, religious pluralism within a Muslim-majority population, and a history of colonialism and rebellion against it. Indonesia's national motto, "Bhinneka Tunggal Ika" ("Unity in Diversity" literally, "many, yet one"), articulates the diversity that shapes the country. Indonesia's economy is the world's 16th largest by nominal GDP and the 7th largest by GDP at PPP. Indonesia is a member of several multilateral organisations, including the UN,[a] WTO, IMF and G20. It is also a founding member of Non-Aligned Movement, Association of Southeast Asian Nations, Asia-Pacific Economic Cooperation, East Asia Summit, Asian Infrastructure Investment Bank and Organisation of Islamic Cooperation. 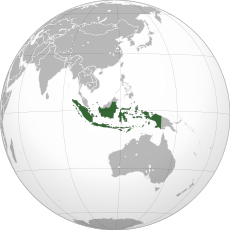 The name Indonesia derives from the Greek name of the Indos (Ἰνδός) and the word nesos (νῆσος), meaning "Indian islands". The name dates to the 18th century, far predating the formation of independent Indonesia. In 1850, George Windsor Earl, an English ethnologist, proposed the terms Indunesians—and, his preference, Malayunesians—for the inhabitants of the "Indian Archipelago or Malayan Archipelago". In the same publication, one of his students, James Richardson Logan, used Indonesia as a synonym for Indian Archipelago. However, Dutch academics writing in East Indies publications were reluctant to use Indonesia; they preferred Malay Archipelago (Maleische Archipel); the Netherlands East Indies (Nederlandsch Oost Indië), popularly Indië; the East (de Oost); and Insulinde. After 1900, Indonesia became more common in academic circles outside the Netherlands, and native nationalist groups adopted it for political expression. Adolf Bastian, of the University of Berlin, popularised the name through his book Indonesien oder die Inseln des Malayischen Archipels, 1884–1894. The first native scholar to use the name was Ki Hajar Dewantara, when in 1913 he established a press bureau in the Netherlands, Indonesisch Pers-bureau. A Borobudur ship carved on Borobudur temple, c. 800 CE. Outrigger boats from the archipelago may have made trade voyages to the east coast of Africa as early as the 1st century CE. Fossils and the remains of tools show that the Indonesian archipelago was inhabited by Homo erectus, known as "Java Man", between 1.5 million years ago and 35,000 years ago. Homo sapiens reached the region around 45,000 years ago. Austronesian peoples, who form the majority of the modern population, migrated to Southeast Asia from what is now Taiwan. They arrived around 4,000 years ago, and as they spread through the archipelago, confined the indigenous Melanesians to the far eastern regions. Ideal agricultural conditions and the mastering of wet-field rice cultivation as early as the 8th century BCE allowed villages, towns, and small kingdoms to flourish by the first century CE. The archipelago's strategic sea-lane position fostered inter-island and international trade, including links with Indian kingdoms and Chinese dynasties, which were established several centuries BCE. Trade has since fundamentally shaped Indonesian history. From the 7th century CE, the powerful Srivijaya naval kingdom flourished as a result of trade and the influences of Hinduism and Buddhism that were imported with it. Between the 8th and 10th century CE, the agricultural Buddhist Sailendra and Hindu Mataram dynasties thrived and declined in inland Java, leaving grand religious monuments such as Borobudur, Sewu and Prambanan. This period marked a renaissance of Hindu-Buddhist art in ancient Java. Around the first quarter of the 10th century, the centre of the kingdom was shifted from Mataram area in central Java to Brantas River valley in eastern Java by Mpu Sindok, who established the Isyana Dynasty. Subsequently, a series of Javanese Hindu-Buddhist polities rose and fell, from Kahuripan kingdom ruled by Airlangga to Kadiri and Singhasari. In western Java, Sunda Kingdom was re-established circa 1030 according to Sanghyang Tapak inscription. In Bali, the Warmadewas established their rule in the 10th century. The Hindu Majapahit kingdom was founded in eastern Java in the late 13th century, and under Gajah Mada, its influence stretched over much of present-day Indonesia. The earliest evidence of a Muslim population in the archipelago dates to the 13th century in northern Sumatra, although Muslim traders first traveled through Southeast Asia early in the Islamic era. Other parts of the archipelago gradually adopted Islam, and it was the dominant religion in Java and Sumatra by the end of the 16th century. For the most part, Islam overlaid and mixed with existing cultural and religious influences, which shaped the predominant form of Islam in Indonesia, particularly in Java. The first regular contact between Europeans and the peoples of the archipelago began in 1512, when Portuguese traders, led by Francisco Serrão, sought to monopolise the sources of nutmeg, cloves, and cubeb pepper in Maluku. Dutch and British traders followed. In 1602, the Dutch established the Dutch East India Company (VOC), and in the following decades, they gained a foothold in Batavia and Amboina. For almost 200 years, the company was the dominant European power in the archipelago. It was dissolved in 1800 following bankruptcy, and the Netherlands established the Dutch East Indies as a nationalised colony. Since the VOC's establishment, the expansion of Dutch territory had primarily been motivated by trade. 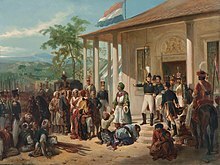 Starting from 1840, however, the Netherlands began a period of expansion to enlarge and consolidate their possessions outside Java, mainly to protect areas already held, and to prevent intervention from other European powers. As a result, the Dutch became involved in numerous wars against various native groups in the archipelago throughout the 19th century, such as the Padri War, Java War and the long and costly Aceh War. It was only in the first half of the 20th century that the Dutch exerted control over what was to become Indonesia's current boundaries, with the addition of Western New Guinea in 1920. In 1901, the Netherlands introduced the Dutch Ethical Policy that was aimed at improving living conditions and welfare, expanding education to native peoples, and preparing the archipelago for self-government under Dutch control. The policy, however, inadvertently contributed to the Indonesian National Awakening, and subsequent rise of independence movements, which the Dutch actively suppressed. During World War II, the Empire of Japan invaded and occupied the archipelago, effectively ending Dutch rule. Famine and forced labour (romusha) were common during the occupation, and war crimes were committed in areas that were deemed important for the Japanese war effort. A later United Nations report stated that the Japanese occupation resulted in a total of 4 million deaths. However, the occupation proved to be fundamental for Indonesian independence, as the Japanese encouraged and facilitated Indonesian nationalism, promoted nationalist figures such as Sukarno, Mohammad Hatta and Ki Hajar Dewantara, and provided weapons and military training. Sukarno, the founding father and first President of Indonesia. Just two days after the surrender of Japan, Sukarno and Hatta proclaimed Indonesian independence on 17 August 1945, and were selected as the country's first President and Vice President respectively. The Netherlands attempted to re-establish their rule, and an armed and diplomatic struggle ensued. In December 1949, the Dutch formally recognised Indonesian independence in the face of international pressure, with the exception of the Netherlands New Guinea, which was later incorporated into Indonesia following the 1962 New York Agreement and the disputed 1969 referendum that led to the ongoing Papua conflict. Despite major internal political, social and sectarian divisions during the struggle, Indonesians, on the whole, found unity in their fight for independence. 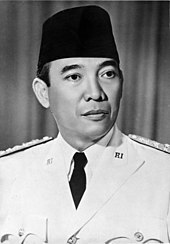 In the late 1950s, Sukarno moved Indonesia from democracy towards authoritarianism, and maintained his power base by balancing the opposing forces of the military and the Communist Party of Indonesia (Partai Komunis Indonesia, PKI). An attempted coup on 30 September 1965 was countered by the army, which led a violent purge that targeted communists, ethnic Chinese and alleged leftists, during which the PKI was blamed for the coup and effectively destroyed. The most widely accepted estimates are that between 500,000 and one million people were killed, with some estimates as high as three million. The head of the military, General Suharto, outmaneuvered the politically weakened Sukarno and was formally appointed president in March 1968. His New Order administration was supported by the United States, and encouraged foreign direct investment, which was a major factor in the subsequent three decades of substantial economic growth. However, his administration was widely accused of corruption and suppression of political opposition. Indonesia was the country hardest hit by the 1997 Asian financial crisis. This increased popular discontent with the New Order and triggered mass protests across the country, which eventually led to Suharto's resignation on 21 May 1998. In 1999, East Timor voted to secede from Indonesia, after a 25-year military occupation that was marked by international condemnation of repression of the East Timorese. In the post-Suharto era, a strengthening of democratic processes has included a regional autonomy programme, and the first direct presidential election in 2004. Political and economic instability, social unrest, corruption, and terrorism slowed progress; however, in recent years the economy has performed strongly. Although relations among different religious and ethnic groups are largely harmonious, sectarian discontent and violence have persisted. Indonesia was the worst hit country by the 2004 Indian Ocean earthquake and tsunami that killed an estimated 167,736 people, mainly in Aceh. The aftermath of the disaster played a part in achieving political settlement to an armed separatist conflict in the region in 2005. Indonesia lies between latitudes 11°S and 6°N, and longitudes 95°E and 141°E. It is the largest archipelagic country in the world, extending 5,120 kilometres (3,181 mi) from east to west and 1,760 kilometres (1,094 mi) from north to south. According to the country's Coordinating Ministry for Maritime Affairs, Indonesia has 17,504 islands (16,056 of which are registered at the UN), scattered over both sides of the equator, and with about 6,000 of them inhabited. The largest are Java, Sumatra, Borneo (shared with Brunei and Malaysia), Sulawesi, and New Guinea (shared with Papua New Guinea). Indonesia shares land borders with Malaysia on Borneo, Papua New Guinea on the island of New Guinea, and East Timor on the island of Timor, and maritime borders with Singapore, Malaysia, Vietnam, the Philippines, Palau, and Australia. At 4,884 metres (16,024 ft), Puncak Jaya is Indonesia's highest peak, and Lake Toba in Sumatra is the largest lake, with an area of 1,145 km2 (442 sq mi). Indonesia's largest rivers are in Kalimantan and New Guinea, and include Kapuas, Barito, Mamberamo, Sepik and Mahakam; such rivers are communication and transport links between the island's river settlements. Lying along the equator, Indonesia's climate tends to be relatively even year-round. Indonesia has two seasons—a wet season and a dry season—with no extremes of summer or winter. For most of Indonesia, the dry season falls between April and October with the wet season between November and March. Indonesia's climate is almost entirely tropical, dominated by the tropical rainforest climate found in every major island of Indonesia, followed by the tropical monsoon climate that predominantly lies along Java's coastal north, Sulawesi's coastal south and east, and Bali, and finally the tropical Savanna climate, found in isolated locations of Central Java, lowland East Java, coastal southern Papua and smaller islands to the east of Lombok. However, cooler climate types do exist in mountainous regions of Indonesia 1,300 to 1,500 metres (4,300 to 4,900 feet) above sea level. The oceanic climate (Köppen Cfb) prevails in highland areas, with fairly uniform precipitation year-round, adjacent to rainforest climates, while the subtropical highland climate (Köppen Cwb) exists in highland areas with a more pronounced dry season, adjacent to tropical monsoon and tropical savanna climates. Köppen-Geiger climate classification map for Indonesia. Some regions, such as Kalimantan and Sumatra, experience only slight differences in rainfall and temperature between the seasons, whereas others, such as Nusa Tenggara, experience far more pronounced differences with droughts in the dry season, and floods in the wet. Rainfall is plentiful, particularly in West Sumatra, West Kalimantan, West Java, and Papua. Parts of Sulawesi and some islands closer to Australia, such as Sumba are drier. The almost uniformly warm waters that make up 81% of Indonesia's area ensure that temperatures on land remain fairly constant. The coastal plains averaging 28 °C (82.4 °F), the inland and mountain areas averaging 26 °C (78.8 °F), and the higher mountain regions, 23 °C (73.4 °F). The area's relative humidity ranges between 70 and 90%. Winds are moderate and generally predictable, with monsoons usually blowing in from the south and east in June through October, and from the northwest in November through March. Typhoons and large scale storms pose little hazard to mariners in Indonesian waters; the major danger comes from swift currents in channels, such as the Lombok and Sape straits. Major volcanoes in Indonesia. Indonesia is in the Pacific Ring of Fire area. Tectonically, Indonesia is highly unstable, making it a site of numerous volcanoes and frequent earthquakes. It lies on the Pacific Ring of Fire where the Indo-Australian Plate and the Pacific Plate are pushed under the Eurasian plate where they melt at about 100 kilometres (62 miles) deep. A string of volcanoes runs through Sumatra, Java, Bali and Nusa Tenggara, and then to the Banda Islands of Maluku to northeastern Sulawesi. Of the 400 volcanoes, around 130 are active. Between 1972 and 1991, 29 volcanic eruptions were recorded, mostly on Java. While volcanic ash has resulted in fertile soils (a factor in historically sustaining high population densities of Java and Bali), it makes agricultural conditions unpredictable in some areas. A massive supervolcano erupted at present-day Lake Toba around 70,000 BCE. It is believed to have caused a global volcanic winter and cooling of the climate, and subsequently led to a genetic bottleneck in human evolution, though this is still debated. The 1815 eruption of Mount Tambora and the 1883 eruption of Krakatoa were among the largest in recorded history. The former resulted in 92,000 deaths and created an umbrella of volcanic ash which spread and blanketed parts of the archipelago, and made much of Northern Hemisphere without summer in 1816. The latter produced the loudest sound in recorded history, and resulted in 36,000 deaths that are attributed to the eruption itself and the tsunamis it created. Significant additional effects were also felt around the world years after the eruption. Recent major disasters due to seismic activity include the 2004 Indian Ocean earthquake and the 2006 Yogyakarta earthquake. Indonesia's size, tropical climate, and archipelagic geography support a high level of biodiversity. Its flora and fauna is a mixture of Asian and Australasian species. The islands of the Sunda Shelf (Sumatra, Java, Borneo, and Bali) were once linked to mainland Asia, and have a wealth of Asian fauna. Large species such as the Sumatran tiger, rhinoceros, orangutan, Asian elephant, and leopard, were once abundant as far east as Bali, but numbers and distribution have dwindled drastically. Sulawesi, Nusa Tenggara, and Maluku – having been long separated from the continental landmasses—have developed their own unique flora and fauna. Papua was part of the Australian landmass, and is home to a unique fauna and flora closely related to that of Australia, including over 600 bird species. Forests cover approximately 70% of the country. However, the forests of the smaller, and more densely populated Java, have largely been removed for human habitation and agriculture. Indonesia is second only to Australia in terms of total endemic species, with 36% of its 1,531 species of bird and 39% of its 515 species of mammal being endemic. Indonesia's 80,000 kilometres (50,000 miles) of coastline are surrounded by tropical seas. The country has a range of sea and coastal ecosystems, including beaches, sand dunes, estuaries, mangroves, coral reefs, seagrass beds, coastal mudflats, tidal flats, algal beds, and small island ecosystems. Indonesia is one of Coral Triangle countries with the world's greatest diversity of coral reef fish with more than 1,650 species in eastern Indonesia only. British naturalist Alfred Russel Wallace described a dividing line (Wallace Line) between the distribution of Indonesia's Asian and Australasian species. It runs roughly north–south along the edge of the Sunda Shelf, between Kalimantan and Sulawesi, and along the deep Lombok Strait, between Lombok and Bali. Flora and fauna on the west of the line are more Asian, while east from Lombok they are increasingly Australian until the tipping point at the Weber Line. In his 1869 book, The Malay Archipelago, Wallace described numerous species unique to the area. The region of islands between his line and New Guinea is now termed Wallacea. Deforestation in Riau province, Sumatra, to make way for an oil palm plantation. Indonesia's large and growing population, and rapid industrialisation, present serious environmental issues. They are often given a lower priority due to high poverty levels and weak, under-resourced governance. Issues include the destruction of peatlands, large-scale illegal deforestation and related wildfires causing heavy smog over parts of western Indonesia, Malaysia and Singapore; over-exploitation of marine resources; and environmental problems associated with rapid urbanisation and industrial development, including air pollution, traffic congestion, garbage management, and reliable water and waste water services. These issues contribute to Indonesia's poor ranking in the 2018 Environmental Performance Index, at 133 out of 180 countries. The report also indicates that Indonesia's performance is among the lowest in the Asia-Pacific region. Much of Indonesia's deforestation is caused by the expansion of palm oil industry that requires land reallocation as well as changes to the natural ecosystems. Expansions can generate wealth for local communities, but it can also degrade ecosystems and cause social problems. This makes Indonesia the world's largest forest-based emitter of greenhouse gases. Such activity also threatens the survival of indigenous and endemic species, including 140 species of mammals identified by the International Union for Conservation of Nature (IUCN) as threatened, and 15 as critically endangered, including the Bali starling, Sumatran orangutan, and Javan rhinoceros. Indonesia is considered at serious risk from projected effects of climate change. It is predicted that unreduced emissions will see an average temperature rise of around 1℃ by mid-century, amounting to almost double the frequency of extremely hot days (above 35℃) per year by 2030, a figure which is predicted to rise further by the end of the century. This will raise the frequency of draught and food shortages, having an impact on precipitation and the patterns of wet and dry seasons upon which Indonesia's agricultural system is based. It will also encourage diseases and increases in wildfires, which threaten the country's huge rainforest. Rising sea levels, at current rates, will result in 42 million households in over 2,000 islands being at risk of submersion by mid-century. A majority of Indonesia's population live in low-lying coastal areas, including the capital Jakarta, the fastest sinking city in the world. Poorer communities will likely be affected the most by climate change. Indonesia is a republic with a presidential system. As a unitary state, power is concentrated in the central government. Following the fall of New Order in 1998, political and governmental structures have undergone major reforms, with four constitutional amendments revamping the executive, legislative and judicial branches. The President of Indonesia is the head of state and head of government, commander-in-chief of the Indonesian National Armed Forces (Tentara Nasional Indonesia, TNI), and the director of domestic governance, policy-making, and foreign affairs. The president appoints a council of ministers, who are not required to be elected members of the legislature. The president may serve a maximum of two consecutive five-year terms. The highest representative body at national level is the People's Consultative Assembly (Majelis Permusyawaratan Rakyat, MPR). Its main functions are supporting and amending the constitution, inaugurating and impeaching the president, and formalising broad outlines of state policy. The MPR comprises two houses; the People's Representative Council (Dewan Perwakilan Rakyat, DPR), with 560 members, and the Regional Representative Council (Dewan Perwakilan Daerah, DPD), with 132. The DPR passes legislation and monitors the executive branch. Reforms since 1998 have markedly increased its role in national governance, while the DPD is a new chamber for matters of regional management. Most civil disputes appear before the State Court (Pengadilan Negeri); appeals are heard before the High Court (Pengadilan Tinggi). The Supreme Court of Indonesia (Mahkamah Agung) is the country's highest court, and hears final cessation appeals and conducts case reviews. Other courts include the Commercial Court, which handles bankruptcy and insolvency; the State Administrative Court (Pengadilan Tata Negara) to hear administrative law cases against the government; the Constitutional Court (Mahkamah Konstitusi) to hear disputes concerning legality of law, general elections, dissolution of political parties, and the scope of authority of state institutions; and the Religious Court (Pengadilan Agama) to deal with codified Islamic Law (sharia) cases. In addition, the Judicial Commission (Komisi Yudisial) monitors the performance of judges. Since 1999, Indonesia has had a multi-party system. In all legislative elections since the fall of New Order, no political party has managed to win an overall majority of seats. The Indonesian Democratic Party of Struggle (PDI-P), which secured the most votes in the 2014 elections, is the party of the current President, Joko Widodo. The Great Indonesia Movement Party (Gerindra) is the third largest political party. Other notable parties include the Party of the Functional Groups (Golkar), the Democratic Party, and the National Awakening Party (PKB). Based on the 2014 elections, the DPR consists of 10 political parties, with a parliamentary threshold of 3.5% of the national vote. The first general election was held in 1955 to elect members of the DPR and the Konstituante. At the national level, Indonesians did not elect a president until 2004. Since then, the president is elected for a five-year term, as are the party-aligned members of the DPR and the non-partisan DPD. Beginning with 2015 local elections, Indonesia starts to elect governors and mayors simultaneously on the same date. Indonesia consists of 34 provinces, five of which have special status. Each province has its own legislature (Dewan Perwakilan Rakyat Daerah, DPRD) and an elected governor. The provinces are subdivided into regencies (kabupaten) and cities (kota), led by regents (bupati) and mayors (walikota) respectively and also their own legislature (DPRD Kabupaten/Kota). These are further subdivided into districts (kecamatan or distrik in Papua), and again into administrative villages (either desa, kelurahan, kampung, nagari in West Sumatra, or gampong in Aceh). This number has evolved over time, the most recent change being the split of North Kalimantan from East Kalimantan in October 2012. The village is the lowest level of government administration. Furthermore, it is divided into several community groups (rukun warga, RW) which are further divided into neighbourhood groups (rukun tetangga, RT). In Java, the village (desa) is divided into smaller units called dusun or dukuh (hamlets), which are the same as RW. Following the implementation of regional autonomy measures in 2001, regencies and cities have become key administrative units, responsible for providing most government services. The village administration level is the most influential on a citizen's daily life and handles matters of a village or neighbourhood through an elected village chief (lurah or kepala desa). Aceh, Jakarta, Yogyakarta, Papua, and West Papua have greater legislative privileges and a higher degree of autonomy from the central government than the other provinces. Aceh has the right to create certain elements of an independent legal system and several regional parties participate only in elections within the province. In 2003, it instituted a form of sharia. Yogyakarta was granted the status of Special Region in recognition of its pivotal role in supporting the Republicans during the National Revolution and its willingness to join Indonesia as a republic. Papua, formerly known as Irian Jaya, was granted special autonomy status in 2001 and was split into Papua and West Papua in February 2003. Jakarta is the country's special capital region (Daerah Khusus Ibukota, DKI). Indonesia currently maintains 132 diplomatic missions abroad, including 95 embassies. The country adheres to what it calls a "free and active" foreign policy, seeking to play a role in regional affairs commensurate with its size and location but avoiding involvement in conflicts among other countries. In contrast to Sukarno's anti-imperialistic antipathy to the West and tensions with Malaysia, foreign policy since the New Order has been based on economic and political cooperation with the former. Indonesia maintains close relations with its neighbours, and is a founding member of ASEAN and the East Asia Summit. The country restored relations with China in 1990 following a freeze in place since anti-communist purge in the mid 1960s. Indonesia also developed close relations with the Soviet Union during the first half of 1960s. As with the majority of countries in the Muslim world, Indonesia does not have diplomatic relations with Israel and has strongly supported the state of Palestine. It does, however, maintain quiet relations with Israel, particularly in trade, tourism and security. Indonesia has been a member of the United Nations since 1950, and was a founding member of the Non-Aligned Movement (NAM) and the Organisation of Islamic Cooperation (OIC). Indonesia is signatory to the ASEAN Free Trade Area agreement, the Cairns Group, and the World Trade Organization (WTO), and an occasional member of OPEC. During the Indonesia–Malaysia confrontation, Indonesia withdrew from the UN due to the latter's election to the United Nations Security Council, although it returned 18 months later. It marked the first time in UN history that a member state had attempted a withdrawal. Indonesia has been a humanitarian and development aid recipient since 1966, and recently, the country has expressed interest in becoming an aid donor. Indonesian Armed Forces. Clockwise from top: Indonesian Army during training session, Sukhoi Su-30, Pindad Anoa, and Indonesian naval vessel KRI Sultan Iskandar Muda 367. Indonesia's Armed Forces (TNI) include the Army (TNI–AD), Navy (TNI–AL, which includes Marine Corps), and Air Force (TNI–AU). The army has about 400,000 active-duty personnel. Defense spending in the national budget was 0.8% of GDP in 2017, and is controversially supplemented by revenue from military commercial interests and foundations. The Armed Forces was formed during the Indonesian National Revolution, when it undertook a guerrilla warfare along with informal militia. As a result of this, and the need to maintain internal security, all branches of the TNI have been organised along territorial lines, aimed at defeating internal enemies and potential external invaders. Since its founding, the military has always had a strong political influence, reaching its greatest extent during the New Order. Following political reforms in 1998, the TNI's formal representation in parliament was removed. Nevertheless, its political influence remains, albeit at a reduced level. Since independence, the country has struggled to maintain unity against local insurgencies and separatist movements. Some, notably in Aceh and Papua, have led to an armed conflict, and subsequent allegations of human rights abuses and brutality from all sides. The former was resolved peacefully in 2005, while the latter still continues, amid a significant, albeit imperfect, implementation of regional autonomy laws, and a reported decline in the levels of violence and human rights abuses since 2004. Other engagements of the army include the campaign against the Netherlands New Guinea to incorporate the territory into Indonesia, the Konfrontasi to oppose the creation of Malaysia, the mass killings of PKI, and the invasion of East Timor, which remains Indonesia's largest military operation. Indonesia has a mixed economy in which both the private sector and government play significant roles. The country has the largest economy in Southeast Asia, a member of the G20, and classified as newly industrialised country. As of 2018[update], it is the world's 16th largest economy by nominal GDP and 7th largest in terms of GDP at PPP, estimated to be US$1.074 trillion and US$3.481 trillion respectively. Its per capita GDP in PPP is US$13,120 while nominal per capita GDP is US$4,116. The debt ratio to GDP is 29.2%. The services are the economy's largest sector and accounts for 43.6% of GDP (2017), followed by industry (39.3%) and agriculture (13.1%). Since 2009, it has employed more people than other sectors, accounting for 47.1% of the total labour force, followed by agriculture (31.1%) and industry (21.7%). Over time, the structure of the economy has changed considerably. Historically, it has been heavily weighted towards agriculture, reflecting both its stage of economic development and government policies in the 1950s and 1960s to promote agricultural self-sufficiency. A gradual process of industrialisation and urbanisation began in the late 1960s, and accelerated in the 1980s as falling oil prices saw the government focus on diversifying away from oil exports and towards manufactured exports. This development continued throughout the 1980s and into the next decade despite the 1990 oil price shock, during which the GDP rose at an average rate of 7.1%. The consistent growth saw the official poverty rate falling from 60% to 15%. From the mid 1980s, the economy became more globally integrated as trade barriers were reduced. The growth, however, ended with the 1997 Asian financial crisis, which severely affected Indonesia both economically and politically. It caused a real GDP contraction by 13.1% in 1998, and inflation reached 72% (later slowed to 2% in 1999). The economy reached its low point in mid-1999 with only 0.8% real GDP growth. Recent strong economic growth has been accompanied by relatively steady inflation, and an increase in GDP deflator and Consumer Price Index. Since 2007, with improvement in banking sector and domestic consumption, growth has accelerated to between 4% and 6% annually. This helped Indonesia weather the 2008–2009 Great Recession, during which the economy performed strongly. In 2011, the country regained the investment grade rating it had lost in 1997. As of 2017[update], 10.12% of the population lived below the poverty line and the official open unemployment rate was 4.3%. Though Indonesia ran a trade surplus from 1975 to 2017, during the last few years exports and imports have decreased at an annual rate of 3 to 4.8%, from US$224 billion and US$173 billion, respectively in 2011. In 2018, the country recorded trade deficit of US$8.57 billion, with total export value of $180.06 billion, and import $188.6 billion. 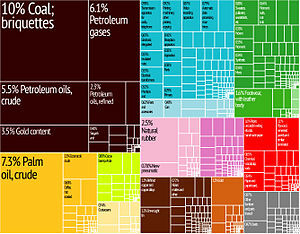 The country's main exports are led by palm oil and coal briquettes, with jewellery, cars and vehicle parts, rubber, and copper ore making up the majority of other exports, while imports mainly consist of refined petroleum and crude petroleum, with telephones, computers, vehicle parts and wheat covering the majority of other imports. The country's main export markets are China (12%), United States (11%), Japan (11%), Singapore (8%) and India (7%), while its main import partners are China (23%), Singapore (11%), Japan (10%), Thailand (7%) and Malaysia (5%). Major transport in Indonesia. Clockwise from top: TransJakarta bus, Jabodetabek Commuter Line, Garuda Indonesia Boeing 737-800, Pelni ship. Indonesia's transport system has been shaped over time by the economic resource base of an archipelago, and the distribution of its 250 million people highly concentrated on Java. All transport modes play a role in the country's transport system and are generally complementary rather than competitive. In 2016, the transport sector generated about 5.2% of GDP. The road transport system is predominant, with a total length of 537,838 kilometres (334,197 miles) as of 2016[update]. Jakarta has the longest bus rapid transit system in the world, boasting some 230.9 kilometres (143.5 miles) in 13 corridors and 10 cross-corridor routes. Rickshaws such as bajaj and becak, and share taxis such as Angkot and Metromini are a common sight in the country. Most of Indonesia's railways are located in Java, used for both passenger and freight transport. The inter-city rail network is complemented by local commuter rail services in Greater Jakarta, Surabaya and Bandung. Mass rapid transit and light rail transit systems are currently under construction in Jakarta and Palembang, and a plan to build a high-speed rail was announced in 2015, the first in Southeast Asia. Indonesia's largest airport, Soekarno–Hatta International Airport is the busiest in the Southern Hemisphere, serving 63 million passengers in 2017. Ngurah Rai International Airport and Juanda International Airport are the country's second and third busiest airport respectively. Garuda Indonesia, the country's flag carrier since 1949, is one of the world's leading airlines and a member of the global airline alliance SkyTeam. Port of Tanjung Priok is the busiest and most advanced Indonesian port, handling more than 50% of Indonesia's trans-shipment cargo traffic. In 2016, Indonesia was the world's 9th largest energy producer with 16.8 quadrillion BTU, and the 15th largest energy consumer, with 7.5 quadrillion BTU. The country has significant energy resources, including 22 billion barrels of conventional oil and gas reserves (of which about 4 billion are recoverable), 8 billion barrels of oil-equivalent of coal-based methane (CBM) resources, and 28 billion tonnes of recoverable coal. While reliance of domestic coal and imported oil has increased, Indonesia has seen progress in renewable energy, with hydropower being the largest source, and has the potential for geothermal, solar, wind, biomass and ocean energy. Indonesia has set out to achieve 23% use of renewable energy by 2025, and 31% by 2050. As of 2015[update], Indonesia's total national installed power generation capacity stands at 55,528.51 MW. Jatiluhur Dam, the country's largest dam, serves several purposes including the provision of hydroelectric power generation, water supply, flood control, irrigation and aquaculture. The earth-fill dam is 105 m (344 ft) high and withholds a reservoir of 3,000,000,000 m3 (2,432,140 acre⋅ft). It helps supplying water to Jakarta and irrigating 240,000 ha (593,053 acres) of rice fields, and has an installed capacity of 186.5 MW which feeds into the Java grid managed by the State Electricity Company (Perusahaan Listrik Negara, PLN). Indonesia's expenditure on science and technology is relatively low, at less than 0.1% of GDP (2017). As a result, it is not considered as a leading country on the subject. However, there are several examples of notable scientific and technological developments by Indonesians. Living in agrarian and maritime culture, they have been famous in some traditional technologies. In the former, as with other nations in Southeast Asia, they are famous in paddy cultivation technique, terasering. Bugis and Makassar people are well known in the latter, making wooden sailing vessel called pinisi boats. In the 1980s, Indonesian engineer Tjokorda Raka Sukawati invented a road construction technique named Sosrobahu that allows long stretches of flyovers to be constructed above existing main roads with minimum traffic disruption. It later became widely used in several countries. The country is also an active producer of passenger trains and freight wagons with its state-owned train manufacturer company, the Indonesian Railway Industry (INKA), and has exported trains abroad. Indonesia has a long history in developing military and small commuter aircraft as the only country in Southeast Asia to produce and develop its own aircraft. With state-owned aircraft company, the Indonesian Aerospace (PT. Dirgantara Indonesia), Indonesia has produced aircraft components for Boeing and Airbus, and with EADS CASA of Spain, developed the CN-235 aircraft that has been exported abroad. Former President B. J. Habibie played an important role in this achievement. Indonesia has also joined the South Korean programme to manufacture the fifth-generation jet fighter KAI KF-X. Indonesia has its own space programme and space agency, the National Institute of Aeronautics and Space (Lembaga Penerbangan dan Antariksa Nasional, LAPAN). In the 1970s, Indonesia became the first developing country to operate its own satellite system called Palapa. It is a series of communication satellites owned by Indosat Ooredoo. 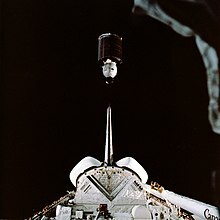 The first satellite, PALAPA A1 was launched on 8 July 1976 from the Kennedy Space Center in Florida, United States. As of 2017[update], Indonesia has launched 16 satellites for various purposes, and the space agency has expressed desire to put satellites in orbit with native launch vehicles by 2040. Borobudur, the world's largest Buddhist temple, is the single most visited tourist attraction in Indonesia. Tourism contributes around US$28.2 billion to GDP in 2017. In the same year, Indonesia received 14.04 million visitors, a growth of 21.8% in one year, spending an average of US$2,009 per person during their visit. China, Singapore, Malaysia, Australia, and Japan are the top five source of visitors to Indonesia. Since January 2011, Wonderful Indonesia has been the slogan of an international marketing campaign directed by the Ministry of Tourism to promote tourism. Nature and culture are major attractions of Indonesian tourism. The former can boast a unique combination of tropical climate, vast archipelago and long stretch of beaches, and are complemented by a rich cultural heritage that reflects Indonesia's dynamic history and ethnic diversity. Indonesia has a well-preserved natural ecosystem with rain forests that stretch over about 57% of Indonesia's land (225 million acres). Forests on Sumatra and Kalimantan are examples of popular destinations, such as the Orangutan wildlife reserve. Moreover, Indonesia has one of world's longest coastlines, measuring 54,716 kilometres (33,999 mi). The ancient Prambanan and Borobudur temples, Toraja and Bali, with its Hindu festivities, are some of the popular destinations for cultural tourism. 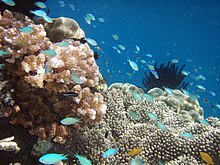 According to Conservation International, Raja Ampat Islands has the highest recorded level of diversity in marine life. Indonesia has 8 UNESCO World Heritage Sites, including the Borobudur Temple Compounds and the Komodo National Park; and a further 19 in tentative list that includes the Jakarta Old Town, Bunaken National Park and Raja Ampat Islands. The heritage tourism is focused on specific interest on Indonesian history, such as colonial architectural heritage of the Dutch East Indies. Other activities include visiting museums, churches, forts and historical colonial buildings, as well as spending some nights in colonial heritage hotels. The popular heritage tourism attractions include the Jakarta Old Town and the royal Javanese courts of Yogyakarta, Surakarta and the Mangkunegaran. The 2017 Travel and Tourism Competitiveness Report ranks Indonesia 42nd out of 136 countries overall with a score of 4.2. It ranks the price competitiveness of Indonesia's tourism sector the 5th out of 136 countries. It states that Indonesia has a strong visa policy and scored well on international openness (ranked 2nd and 17th respectively). The country also scores well on natural and cultural resources (ranked 17th and 23rd respectively). However, Indonesia has a low score in infrastructure (ranked 96th), as some aspects of tourist service infrastructure are underdeveloped. The 2010 census recorded Indonesia's population as 237.6 million, with high population growth at 1.9%. 58% of the population lives in Java, the world's most populous island. The population density is 138 people per km2 (357 per sq mi), ranking 88th in the world, although Java has a population density of 1,067 people per km2 (2,435 per sq mi). The population is unevenly spread throughout the islands within a variety of habitats and levels of development, ranging from the megalopolis of Jakarta to uncontacted tribes in Papua. In 1961, the first post-colonial census gave a total population of 97 million. The country currently possesses a relatively young population, with a median age of 30.2 years (2017 estimate). The population is expected to grow to around 295 million by 2030 and 321 million by 2050. Around 8 million Indonesians live overseas, with most of them settled in Malaysia, Netherlands, Saudi Arabia, United Arab Emirates, Hong Kong, Singapore, United States, and Australia. A map of major ethnic groups in Indonesia. Indonesia is a very ethnically diverse country, with around 300 distinct native ethnic groups. Most Indonesians descend from Austronesian-speaking peoples whose languages can be traced to Proto-Austronesian, which possibly originated in what is now Taiwan. 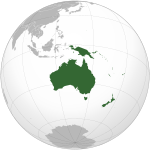 Another major grouping are the Melanesians, who inhabit eastern Indonesia (Maluku Islands and Western New Guinea). The Javanese are the largest ethnic group, comprising 40.2% of the population. They are predominantly located in the central to eastern parts of Java and also significant numbers in most provinces of Indonesia. The Sundanese, Batak and Madurese are the largest non-Javanese groups. [b] A sense of Indonesian nationhood exists alongside strong regional identities. The country's official language is Indonesian, a variant of Malay based on its prestige dialect, which for centuries had been the lingua franca of the archipelago. It was promoted by nationalists in the 1920s, and declared the official language under the name Bahasa Indonesia in 1945. As a result of contact with other languages spanning centuries, it is rich in local and foreign influences, including from Javanese, Sundanese, Minangkabau, Hindi, Sanskrit, Chinese, Arabic, Dutch, Portuguese and English. Nearly every Indonesian speaks the language due to its widespread use in education, academics, communications, business, politics, and mass media. Most Indonesians also speak at least one of more than 700 local languages, often as their first language. Some belong to the Austronesian language family, while over 270 Papuan languages are spoken in eastern Indonesia. Of these, Javanese is the most widely spoken. In 1930, Dutch and other Europeans (Totok), Eurasians, and derivative people like the Indos, numbered 240,000 or 0.4% of the total population. Historically, they constituted only a tiny fraction of the native population and continue to do so today. Despite the Dutch presence for almost 350 years, the Dutch language has no official status and the small minority that can speak the language fluently are either educated members of the oldest generation, or employed in the legal profession, as certain law codes are still only available in Dutch. While religious freedom is stipulated in the constitution, the government officially recognises only six religions: Islam, Protestantism, Roman Catholicism, Hinduism, Buddhism, and Confucianism; although indigenous religions are also partly recognised. Indonesia is the world's most populous Muslim-majority country with 227 million adherents in 2017, with the majority being Sunnis (99%). The Shias and Ahmadis respectively constitute 1% (1—3 million) and 0.2% (200,000—400,000) of the Muslim population. Christians make up almost 10% of the population, and the rest are Hindus, Buddhist and other. 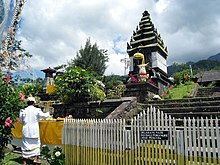 Most Indonesian Hindus are Balinese, and most Buddhists are ethnic Chinese. An overwhelming majority of Indonesians consider religion to be very important, and its role is present in almost all aspects of society, including politics, education, marriage, and public holidays. Ten out of 15 national holidays in 2019 are related to religion. A Hindu shrine dedicated to Sri Baduga Maharaja in Pura Parahyangan Agung Jagatkarta, Bogor. Hinduism left a significant impact and imprint in Indonesian art and culture. Prior to the arrival of Hinduism, Buddhism and Abrahamic religions, the natives of the Indonesian archipelago practiced indigenous animism and dynamism, beliefs that are common to Austronesian people. They venerated and revered ancestral spirit, and believed that supernatural spirits (hyang) may inhabit certain places such as large trees, stones, forests, mountains, or sacred places. Examples of Indonesian native belief systems include the Sundanese Sunda Wiwitan, Dayak's Kaharingan, Torajan Aluk' To Dolo, Manusela and Nuaulu's Naurus, Batak's Parmalim and Pemena faiths, and the Javanese Kejawèn. They have had significant impact on how other faiths are practiced, evidenced by a large proportion of people—such as the Javanese abangan, Balinese Hindus, and Dayak Christians—practicing a less orthodox, syncretic form of their religion. Hindu influences reached the archipelago as early as the first century CE. Around 130, a Sundanese kingdom named Salakanagara emerged in western Java, and is the first historically recorded Indianised kingdom in the archipelago, created by an Indian trader after marrying a local Sundanese princess. Arriving around the sixth century, the history of Buddhism in Indonesia is closely related to that of Hinduism, as a number of empires based on Buddhist culture were established around the same period. The archipelago has witnessed the rise and fall of powerful and influential Hindu and Buddhist empires such as Majapahit, Sailendra, Srivijaya and Mataram. Though no longer a majority, Hinduism and Buddhism remain defining influences in Indonesian culture. Eid al-Fitr mass prayer in Istiqlal Mosque, Jakarta. Islam was introduced to the archipelago by Sunni traders of the Shafi'i school of jurisprudence, as well as Sufi traders from the Indian subcontinent and southern Arabian peninsula. Its spread was accelerated by missionary works, such as by the Wali Sanga and Chinese explorer Zheng He, and military campaigns by several sultanates. For the most part, Islam overlaid and mixed with non-Islamic cultural and religious influences that resulted in a distinct form of Islam, particularly in comparison to the Middle East. Trends of thought within Islam in the country can be broadly categorised into two orientations; "modernism" which closely adheres to orthodoxy while embracing modern learning, and "traditionalism" which tends to follow the interpretations of local religious leaders and teachers at Islamic boarding schools (pesantren), that are supported by Indonesia's two largest Islamic civil society groups Muhammadiyah and Nahdlatul Ulama respectively. Mass at the Jakarta Cathedral. Catholicism was brought to the archipelago by Portuguese traders and missionaries such as Jesuit Francis Xavier, who visited and baptised several thousand locals. Its spread faced difficulty due to the VOC policy of banning the religion and the Dutch hostility due to the Eighty Years' War against Catholic Spain's rule. In present-day Flores, the royal house of Larantuka formed the only native Catholic kingdom in Southeast Asia around 16th century, with the first king named Lorenzo. Protestantism is largely a result of Calvinist and Lutheran missionary efforts during the Dutch colonial era. Although they are the most common branch, a multitude of other denominations can be found elsewhere in Indonesia. The Batak Protestant Christian Church, founded in 1861 by German Lutheran missionary Ludwig Ingwer Nommensen, is the largest one. Bandung Institute of Technology in West Java. Education in Indonesia is compulsory for 12 years. Parents can choose between state-run, non sectarian public schools supervised by the Ministry of Education and Culture or private or semi-private religious (usually Islamic) schools supervised and financed by the Department of Religious Affairs. Private international schools, which are not based on the national curriculum, are also available. The enrolment rate is 90% for primary education, 76% for secondary education, and 24% for tertiary education (2015). The literacy rate is 95% (2016) and the government spends about 3.6% of GDP (2015) on education. In 2018, there were more than 4,500 higher educational institutions in Indonesia. The top universities in the country are University of Indonesia, Bandung Institute of Technology and Gadjah Mada University. All of them are located in Java. Andalas University is pioneering the establishment of a leading university outside of Java. Government expenditure on healthcare is about 3.3% of GDP in 2016. As part of an attempt to achieve universal health care, the government launched the National Health Insurance (Jaminan Kesehatan Nasional, JKN) in 2014. Citizens are protected under the programme and receive coverage for a range of health services from public as well as private firms that have opted to join the scheme. In recent decades, health indicators have significantly improved such as rising life expectancy (from 63 in 1990 to 71 in 2012) and declining child mortality (from 84 deaths per 1,000 births in 1990 to 27 deaths in 2015). Nevertheless, Indonesia continues to face health challenges that include maternal and child health, low air quality, malnutrition, high rate of smoking, and communicable diseases. Close to 80% of Indonesia's population lives in the western parts of the archipelago, but they are growing at a slower pace than the rest of the country. This has created a gap in wealth, unemployment rate, and health between densely populated islands and economic centres (such as Sumatra and Java) and sparsely populated, disadvantaged areas (such as Maluku and Papua). Racism, especially against Chinese Indonesians since the colonial period, is still common today. Religious intolerance has long been a feature of the country's society. In 2017, the Chinese Christian governor of Jakarta Basuki Tjahaja Purnama was sentenced to two years in prison after being found guilty of blasphemy. LGBT issues have recently gained attention in Indonesia. While homosexuality is legal in most parts of the country, it is illegal in Aceh and South Sumatra. LGBT people and activists have regularly faced fierce opposition, intimidation, and discrimination, launched even by authorities. Cultural history of the Indonesian archipelago spans more than two millennia. Influences from the Indian subcontinent, mainland China, the Middle East, Europe, and the Austronesian peoples have historically shaped the cultural, linguistic and religious make-up of the archipelago. As a result, modern-day Indonesia has a multicultural, multilingual and multi-ethnic society, with complex cultural mixture that differs significantly from the original indigenous cultures. Indonesia currently holds 9 items of UNESCO's Intangible Cultural Heritage, which include wayang puppet theatre, kris, batik, education and training on making Indonesian batik, angklung, saman dance, noken, and the three genres of traditional Balinese dance. 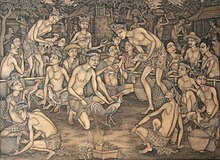 Traditional Balinese painting depicting cockfighting. Indonesian arts include both age-old art forms developed through centuries, and a recently developed contemporary art. Despite often displaying local ingenuity, Indonesian arts have absorbed foreign influences—most notably from India, the Arab world, China and Europe, as a result of contacts and interactions facilitated, and often motivated, by trade. The art of painting is quite developed in Bali, where its people are famed for their artistry. Their painting tradition started as classical Kamasan or Wayang style visual narrative, derived from visual art discovered on candi bas reliefs in eastern Java. It is notable for its highly vigorous yet refined intricate art that resembles baroque folk art with tropical themes. An avenue of Tongkonan houses in a Torajan village. Megalithic sculpture has been discovered on several sites in Indonesia. Subsequently, tribal art has flourished within the culture of Nias, Batak, Asmat, Dayak and Toraja. Wood and stone are common materials used as the media for sculpting among these tribes. Between the 8th and 15th century, Javanese civilisation has developed a refined stone sculpting art and architecture which was influenced by Hindu-Buddhist Dharmic civilisation. The temples of Borobudur and Prambanan are among the most famous examples of the practice. As with the arts, Indonesian architecture has absorbed foreign influences that has brought cultural changes and profound effect on building styles and techniques. The most dominant influence has traditionally been Indian; however, Chinese, Arab, and European influences have also been significant. Traditional carpentry, masonry, stone and woodwork techniques and decorations have thrived in vernacular architecture, with numbers of traditional houses' (rumah adat) styles have been developed. The traditional houses and settlements of the numerous ethnic groups of Indonesia vary widely and have their own specific history. They are at the centre of a web of customs, social relations, traditional laws and religions that bind the villagers together. Examples include Toraja's Tongkonan, Minangkabau's Rumah Gadang and Rangkiang, Javanese style Pendopo pavilion with Joglo style roof, Dayak's longhouses, various Malay houses, Balinese houses and temples, and also various styles of rice barns (lumbung). Indonesian music and dance. Clockwise from top: A gamelan player, Angklung, Sundanese Jaipongan Mojang Priangan dance, Balinese Pendet dance. The music of Indonesia predates historical records. Various indigenous tribes incorporate chants and songs accompanied with musical instruments in their rituals. Angklung, kacapi suling, siteran, gong, gamelan, degung, gong kebyar, bumbung, talempong, kulintang and sasando are examples of traditional Indonesian instruments. The diverse world of Indonesian music genres are the result of the musical creativity of its people, and subsequent cultural encounters with foreign influences. These include gambus and qasida from the Middle East, keroncong from Portugal, and dangdut—one of the most popular music genres in Indonesia—with notable Hindi influence as well as Malay orchestras. Today, the Indonesian music industry enjoys both nationwide and regional popularity in Malaysia, Singapore and Brunei, due to common culture and intelligible languages between Indonesian and Malay. Indonesian dances have a diverse history, with more than 3,000 original dances. Scholars believe that they have had their beginning in rituals and religious worship, such as war dances, dance of witch doctors, and dance to call for rain or any agricultural-related rituals such as Hudoq. Indonesian dances derive its influences from the archipelago's three distinct historical eras: the prehistoric and tribal era, the Hindu-Buddhist era, and the Islamic era. In recent times, modern dances are also showcased in show business, such as those that accompany music performances or entertainment. Influenced by Western culture, urban teen dances such as street dances have gained popularity among the Indonesian youth. Traditional dances, however, such as the Javanese, Sundanese, Minang, Balinese, Saman continue to be a living and dynamic traditions. Indonesia has a variety style of clothing as a result from its long and rich cultural history. Its national costume is derived from the indigenous culture of the country and traditional textile traditions. Since Java is the political, economic and cultural center of Indonesia, the Javanese Batik and Kebaya are arguably Indonesia's most recognised national costume, although they originally belong not only to the Javanese, but also Sundanese and Balinese cultures as well. Each province in the country has their own representation of traditional attire and dress, such as Ulos of Batak from North Sumatra; Songket of Malay and Minangkabau from Sumatra; and Ikat of Sasak from Lombok. National costumes are worn during traditional weddings, formal ceremonies and music performances where attires of regional costumes are clearly visible ranging from traditional to modern attire, as well as on government and official occasions, with the most visible display being those worn by diplomats, the President and the First Lady. In 2009, Batik was recognised by UNESCO as a Masterpiece of Oral and Intangible Heritage of Humanity. Wayang, the Javanese, Sundanese, and Balinese shadow puppet theatre display several mythological legends such as Ramayana and Mahabharata. Various Balinese dance drama can also be included within the traditional form of Indonesian drama. Another form of local drama is the Javanese Ludruk and Ketoprak, the Sundanese Sandiwara, and Betawi Lenong. These dramas incorporate humor and jest, and often involve audiences in their performances. Some theatre tradition involves not only drama but also music, dancing and the silat martial art such as Randai from Minangkabau people of West Sumatra. It is usually performed for traditional ceremonies and festivals, and based on semi-historical Minangkabau legends and love story. Modern performing art also developed in Indonesia with their distinct style of drama. Notable theatre, dance, and drama troupe such as Teater Koma are popular in the country as it often portrays social and political satire of Indonesian society. 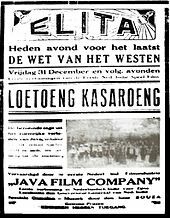 Advertisement for Loetoeng Kasaroeng (1926), the first fiction film produced in the Dutch East Indies. The first domestically produced film in the archipelago was Loetoeng Kasaroeng, a silent film by Dutch director L. Heuveldorp. This adaptation of the Sundanese legend was made with local actors by the NV Java Film Company in Bandung. After independence, the film industry expanded rapidly, with six films made in 1949 rising to 58 in 1955. Djamaluddin Malik's Persari Film often emulated American genre films and the working practices of the Hollywood studio system, as well as remaking popular Indian films. The latter part of Sukarno era saw the use of cinema for nationalistic, anti-Western purposes, and foreign films were subsequently banned, while films during the New Order were regulated through a censorship code that aimed to maintain social order. The film industry's popularity peaked in the 1980s and dominated cinemas, although it declined significantly in the early 1990s. Films made during this period include Pintar-pintar Bodoh (1982), Maju Kena Mundur Kena (1984), Nagabonar (1987), Catatan Si Boy (1989), and Warkop's comedy films. Deddy Mizwar, Eva Arnaz, Meriam Bellina, and Rano Karno were among the well-known actors during this period. Independent filmmaking was a rebirth of the film industry in the post-Suharto era, where films started addressing topics that were previously banned, such as religion, race, and love. Between 2000 and 2005, the number of films released each year steadily increased. Riri Riza and Mira Lesmana were among the new generation of film figures who co-directed Kuldesak (1999), Petualangan Sherina (2000), Ada Apa dengan Cinta? (2002) and Laskar Pelangi (2008). In 2016, Warkop DKI Reborn: Jangkrik Boss Part 1 smashed box office records, becoming the most-watched Indonesian film with 6.8 million tickets sold. Indonesia has held annual film festivals and awards, including the Indonesian Film Festival (Festival Film Indonesia) that has been held intermittently since 1955. It hands out the Citra Award, the film industry's most prestigious award. From 1973 to 1992, the festival was held annually and then discontinued until it was later revived in 2004. 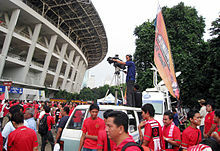 MetroTV at Gelora Bung Karno Stadium, reporting the 2010 AFF Championship. Media freedom increased considerably after the fall of New Order, during which the Ministry of Information monitored and controlled domestic media, and restricted foreign media. The television market includes several national commercial networks and provincial networks that compete with public TVRI, which held monopoly on TV broadcasting from 1962 to 1989. By early 21st century, the improved communications system had brought television signals to every village and people can choose from up to 11 channels. Private radio stations carry their own news bulletins and foreign broadcasters supply programmes. The number of printed publications has increased significantly since 1998. More than 30 million cell phones are sold each year and 27% of them are local brands. Like other developing countries, Indonesia began the development of Internet in the early 1990s. Its first commercial Internet service provider, PT. Indo Internet, began operation in Jakarta in 1994. With estimated users of 88 million as of 2016[update], Indonesia is among the largest countries by number of Internet users, though penetration is relatively low. The majority of Internet users are between the ages of 18 and 25, with an average usage of 4.7 hours daily, and depend primarily on mobile phones for access, which outnumber both laptop and personal computer users. The oldest evidence of writing in the Indonesian archipelago is a series of Sanskrit inscriptions dated to the 5th century. Many of Indonesia's peoples have strongly rooted oral traditions, which help to define and preserve their cultural identities. In written poetry and prose, a number of traditional forms dominate, mainly syair, pantun, gurindam, hikayat and babad. Some of these works are Syair Raja Siak, Syair Abdul Muluk, Hikayat Abdullah, Hikayat Bayan Budiman, Hikayat Hang Tuah, Sulalatus Salatin, and Babad Tanah Jawi. Early modern Indonesian literature originates in Sumatran tradition. Balai Pustaka, the government bureau for popular literature, was instituted around 1920 to promote the development of indigenous literature. It adopted Malay as the preferred common medium for Indonesia. Important figures in modern Indonesian literature include: Dutch author Multatuli, who criticised treatment of natives under Dutch colonial rule; Sumatrans Mohammad Yamin and Hamka, who were influential pre-independence nationalist writers and politicians; and proletarian writer Pramoedya Ananta Toer, Indonesia's most famous novelist. Pramoedya earned several accolades, and was often discussed as Indonesia's and Southeast Asia's best candidate for a Nobel Prize in Literature. Literature and poetry flourished even more in the first half of the 20th century. 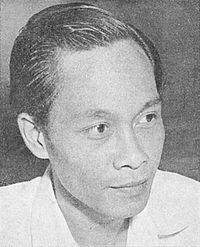 Major authors include Chairil Anwar (Aku), Marah Roesli (Sitti Nurbaya), Merari Siregar (Azab dan Sengsara), Abdul Muis (Salah Asuhan), Djamaluddin Adinegoro (Darah Muda), Sutan Takdir Alisjahbana (Layar Terkembang), and Amir Hamzah (Nyanyi Sunyi) whose works are among the most well known in Maritime Southeast Asia. Nasi Padang with rendang, gulai and vegetables. Indonesian cuisine is one of the most diverse, vibrant and colourful in the world, full of intense flavour. Many regional cuisines exist, often based upon indigenous culture and foreign influences such as Chinese, European, Middle Eastern, and Indian precedents. Rice is the main staple food and is served with side dishes of meat and vegetables. Spices (notably chili), coconut milk, fish and chicken are fundamental ingredients. Some popular dishes such as nasi goreng, gado-gado, sate, and soto are very common in the country and considered as national dishes. The Ministry of Tourism, however, chose tumpeng as the official national dish in 2014, describing it as binding the diversity of various culinary traditions. Other popular dishes include rendang, one of the many Padang cuisines along with dendeng and gulai. In 2017, rendang was chosen as the "World's Most Delicious Food" by the CNN Travel reader's choice. Another fermented food is oncom, similar in some ways to tempeh but uses a variety of bases (not only soy), created by a different fungi, and particularly popular in West Java. A demonstration of Pencak Silat, a form of martial arts. Sports are generally male-oriented and spectators are often associated with illegal gambling. Badminton and football are the most popular sports in the country. Indonesian badminton players have won the Thomas Cup (the world team championship of men's badminton) 13 times since it was held in 1949, as well as numerous Olympic medals since the sport gained full Olympic status in 1992. Indonesian women have won the Uber Cup, the female equivalent of the Thomas Cup, 3 times, in 1975, 1994 and 1996. Liga 1 is the country's premier football club league. On the international stage, Indonesia has experienced limited success despite being the first Asian team to participate in the FIFA World Cup in 1938 as Dutch East Indies. On continental level, Indonesia won the bronze medal in the 1958 Asian Games. Indonesia's first appearance in the AFC Asian Cup was in 1996, and successfully qualified for the next three tournaments. They, however, failed to progress through the next stage in all occasions. Other popular sports include boxing and basketball, which has a long history in Indonesia and was part of the first National Games (Pekan Olahraga Nasional, PON) in 1948. Some of the famous Indonesian boxers include Ellyas Pical, three times IBF Super flyweight champion; Nico Thomas, Muhammad Rachman, and Chris John. In motorsport, Rio Haryanto became the first Indonesian to compete in Formula One in 2016. Sepak takraw, and karapan sapi (bull racing) in Madura are some examples of traditional sports in Indonesia. In areas with a history of tribal warfare, mock fighting contests are held, such as caci in Flores and pasola in Sumba. Pencak Silat is an Indonesian martial art and in 1987, became one of the sporting events in Southeast Asian Games, with Indonesia appearing as one of the leading forces. In Southeast Asia, Indonesia is one of the major sport powerhouses by winning the Southeast Asian Games 10 times since 1977, most recently in 2011. ^ Temporarily withdrew on 20 January 1965. ^ Small but significant populations of ethnic Chinese, Indians, Europeans and Arabs are concentrated mostly in urban areas. ^ "Pancasila". U.S. Library of Congress. 3 February 2017. Archived from the original on 5 February 2017. Retrieved 5 February 2017. ^ Vickers 2005, p. 117. ^ a b c d Simons, Gary F.; Fennig, Charles D. "Ethnologue: Languages of the World, Twenty-first edition". SIL International. Retrieved 20 September 2018. ^ a b Na'im, Akhsan; Syaputra, Hendry (2010). "Nationality, Ethnicity, Religion, and Languages of Indonesians" (PDF) (in Indonesian). Statistics Indonesia (BPS). Archived (PDF) from the original on 23 September 2015. Retrieved 23 September 2015. ^ a b "2010 Census: Population by Region and Religion". BPS. 15 May 2010. Retrieved 20 November 2011. ^ "UN Statistics" (PDF). United Nations. 2005. Archived (PDF) from the original on 31 October 2007. Retrieved 31 October 2007. ^ a b "Jumlah dan Distribusi Penduduk". BPS. May 2010. Retrieved 13 April 2018. ^ a b c d "World Economic Outlook Database, October 2018". IMF.org. International Monetary Fund. Retrieved 23 February 2019. ^ a b "Human Development Indices and Indicators: 2018 Statistical update" (PDF). United Nations Development Programme. 15 September 2018. Archived (PDF) from the original on 17 September 2018. Retrieved 15 September 2018. ^ a b "16,000 Indonesian islands registered at UN". The Jakarta Post. 21 August 2017. Archived from the original on 30 November 2018. Retrieved 3 December 2018. ^ "Indonesia – The Next Major Oil Importer?". Seeking Alpha. 10 January 2017. Archived from the original on 6 February 2017. Retrieved 6 February 2017. ^ a b Ricklefs 2001, p. 379. ^ a b "Highest population, island". Guinness World Records. Archived from the original on 6 June 2017. Retrieved 6 June 2017. ^ a b Salikha, Adelaida (29 January 2018). "Meet The 10 Megadiverse Countries In The World". SEAsia. Archived from the original on 8 February 2018. Retrieved 8 February 2018. ^ a b "Indonesia". The Observatory of Economic Complexity. 2016. Retrieved 19 November 2016. ^ Workman, Daniel (26 December 2017). "Indonesia's Top Trading Partners". World's Top Exports. Archived from the original on 25 February 2018. Retrieved 25 February 2018. ^ Burhanudin, Jajat; van Dijk, Kees (31 January 2013). "Islam in Indonesia: Contrasting Images and Interpretations". Amsterdam University Press. Retrieved 17 November 2016 – via Google Books. ^ Lamoureux, Florence (2003). "Indonesia: A Global Studies Handbook". ABC-CLIO Corporate. Retrieved 17 November 2016 – via Google Books. ^ a b Tomascik, T.; Mah, J.A. ; Nontji, A.; Moosa, M.K. (1996). The Ecology of the Indonesian Seas – Part One. Hong Kong: Periplus Editions. ISBN 978-962-593-078-7. ^ a b Anshory, Irfan (16 August 2004). "The origin of Indonesia's name" (in Indonesian). Pikiran Rakyat. Archived from the original on 15 December 2006. Retrieved 15 December 2006. ^ Earl 1850, p. 119. ^ Logan, James Richardson (1850). "The Ethnology of the Indian Archipelago: Embracing Enquiries into the Continental Relations of the Indo-Pacific Islanders". Journal of the Indian Archipelago and Eastern Asia (JIAEA): 4:252–347. ^ Earl 1850, pp. 254, 277–278. ^ a b Justus M van der Kroef (1951). "The Term Indonesia: Its Origin and Usage". Journal of the American Oriental Society. 71 (3): 166–171. doi:10.2307/595186. JSTOR 595186. ^ Brown, Colin (2003). A short history of Indonesia: the unlikely nation?. Allen & Unwin. p. 13. ISBN 978-1-86508-838-9. ^ Choi, Kildo; Driwantoro, Dubel (2007). "Shell tool use by early members of Homo erectus in Sangiran, central Java, Indonesia: cut mark evidence". Journal of Archaeological Science. 34: 48. doi:10.1016/j.jas.2006.03.013. ^ "Finding showing human ancestor older than previously thought offers new insights into evolution". TerraDaily. 5 July 2011. Archived from the original on 27 November 2017. Retrieved 29 January 2012. ^ Pope, G.G. (1988). "Recent advances in far eastern paleoanthropology". Annual Review of Anthropology. 17: 43–77. doi:10.1146/annurev.an.17.100188.000355. cited in Whitten, T.; Soeriaatmadja, R.E. ; Suraya, A.A. (1996). The Ecology of Java and Bali. Hong Kong: Periplus Editions. pp. 309–412. ; Pope, G.G. (1983). "Evidence on the age of the Asian Hominidae". Proceedings of the National Academy of Sciences of the United States of America. 80 (16): 4988–4992. Bibcode:1983PNAS...80.4988P. doi:10.1073/pnas.80.16.4988. PMC 384173. PMID 6410399. ; de Vos, J.P.; Sondaar, P.Y. (1994). "Dating hominid sites in Indonesia". Science. 266 (16): 4988–4992. Bibcode:1994Sci...266.1726D. doi:10.1126/science.7992059. ^ Gugliotta, Guy (July 2008). "The Great Human Migration". Smithsonian Maganize. Retrieved 21 August 2011. ^ a b Taylor 2003, pp. 5–7. ^ Taylor 2003, pp. 8–9. ^ Taylor 2003, pp. 15–18. ^ Taylor 2003, pp. 3, 9–11, 13–5, 18–20, 22–3. ^ Vickers 2005, pp. 18–20, 60, 133–4. ^ Shelby, Karen (2014-12-29). "Buddhist Art and Architecture in Southeast Asia After 1200". Art History Teaching Resources. Retrieved 20 May 2016. ^ Coedès, George (1968). "The Indianized States of South-East Asia". University of Hawaii Press. p. 128. Retrieved 21 October 2017 – via Google Books. ^ Lewis, Peter (1982). "The next great empire". Futures. 14 (1): 47–61. doi:10.1016/0016-3287(82)90071-4. ^ Ricklefs 1991, pp. 3–14. ^ a b Ricklefs 1991, pp. 12–14. ^ Ricklefs 1991, pp. 22–24. ^ van Elderen, Wieze. "The Dutch East India Company". European Heritage Project. Archived from the original on 6 September 2015. Retrieved 6 September 2015. ^ Ricklefs 1991, p. 24. ^ Reid (1974), pp. 2–3. ^ a b Rahardjo, Tjahjono (2013). Between Two Worlds: Ethical Policy, Western education and Javanese arts. Academia.edu. ^ a b Beck, Vincent Alexander (30 August 2015). "The Remnants of the Japanese Occupation of Modern Indonesia". E-International Relations Student. Archived from the original on 14 September 2017. Retrieved 24 October 2018. ^ Ricklefs 1991; Gert Oostindie; Bert Paasman (1998). "Dutch Attitudes towards Colonial Empires, Indigenous Cultures, and Slaves". Eighteenth-Century Studies. 31 (3): 349–355. doi:10.1353/ecs.1998.0021. ^ "Indonesia: World War II and the Struggle for Independence, 1942–50; The Japanese Occupation, 1942–45". Library of Congress. November 1992. Archived from the original on 11 February 2013. Retrieved 11 February 2013. ^ Hubertus van Mook (1949). "Indonesia". Royal Institute of International Affairs. 25 (3): 274–285. doi:10.2307/3016666. JSTOR 3016666. ^ Friend 2003, p. 35. ^ Cordell, Marni (28 August 2013). "The West Papuan independence movement – a history". The Guardian. Archived from the original on 16 September 2017. Retrieved 16 September 2017. ^ Ricklefs 1991, pp. 237–280. ^ Friend 2003, pp. 107–109. ^ Chris Hilton (writer and director) (2001). Shadowplay (Television documentary). Vagabond Films and Hilton Cordell Productions. ^ Ricklefs 1991, pp. 280–283, 284, 287–290. ^ "Indonesia massacres: Declassified US files shed new light". BBC. 17 October 2017. Archived from the original on 31 May 2018. Retrieved 19 September 2018. ^ John D. Legge (1968). "General Suharto's New Order". Royal Institute of International Affairs. 44 (1): 40–47. doi:10.2307/2613527. JSTOR 2613527. ^ Melvin, Jess (2018). The Army and the Indonesian Genocide: Mechanics of Mass Murder. Routledge. pp. 9–10. ISBN 978-1-138-57469-4. ^ Vickers 2005, p. 163. ^ Robinson, Geoffrey B. (2018). The Killing Season: A History of the Indonesian Massacres, 1965-66. Princeton University Press. p. 206. ISBN 978-1-4008-8886-3. ^ Delhaise, Philippe F (1998). Asia in Crisis: The Implosion of the Banking and Finance Systems. Willey. p. 123. ISBN 978-0-471-83450-2. ^ "President Suharto resigns". BBC. 21 May 1998. Archived from the original on 14 November 2017. Retrieved 14 November 2017. ^ "Ford and Kissinger Gave Green Light to Indonesia's Invasion of East Timor, 1975: New Documents Detail Conversations with Suharto". National Security Archive. 6 December 2001. Archived from the original on 10 December 2017. Retrieved 10 December 2017. ^ "The Carter Center 2004 Indonesia Election Report" (PDF). The Carter Center. Archived (PDF) from the original on 14 June 2007. Retrieved 14 June 2007. ^ "Ethnic and Religious Violence in Indonesia". Indonesia Investments. 23 December 2016. Archived from the original on 17 August 2017. Retrieved 17 August 2017. ^ "UN Office of the Special Envoy for Tsunami Recovery". United Nations. 25 March 2007. Archived from the original on 19 May 2007. Retrieved 19 May 2007. ^ a b "Memorandum of Understanding between the Government of the Republic of Indonesia and the Free Aceh Movement" (PDF). BBC. 15 August 2005. Archived (PDF) from the original on 6 February 2017. Retrieved 9 August 2018. ^ Kuoni 1999, p. 88. ^ a b c "The World Factbook: Indonesia". Central Intelligence Agency. 29 October 2018. Retrieved 11 November 2018. ^ "Republic of Indonesia". Microsoft Encarta. 2006. Archived from the original on 1 November 2009. Retrieved 1 November 2009. ^ "Climate: Observations, projections and impacts" (PDF). Met Office Hadley Centre. Archived (PDF) from the original on 16 August 2017. Retrieved 16 August 2017. ^ a b "Indonesia and Climate Change: Current Status and Policies" (PDF). World Bank. Archived (PDF) from the original on 27 December 2016. Retrieved 27 December 2016. ^ Chaves, Nicole (29 September 2018). "Why Indonesia has so many earthquakes". CNN. Retrieved 30 September 2018. ^ Witton 2003, p. 38. ^ "Indonesia: Volcano nation". BBC. 5 November 2015. Archived from the original on 28 November 2017. Retrieved 28 November 2017. ^ Whitten, T; Soeriaatmadja, R. E.; Suraya A. A. (1996). The Ecology of Java and Bali. Hong Kong: Periplus Editions Ltd. pp. 95–97. ^ Sylviane L. G. Lebon (January 2009). "Volcanic activity and environment: Impacts on agriculture and use of geological data to improve recovery processes" (PDF). University of Iceland. Archived (PDF) from the original on 27 December 2016. Retrieved 27 December 2016. ^ Bressan, David (11 August 2017). "Early Humans May Have Lived Through A Supervolcano Eruption". Forbes. Archived from the original on 11 August 2017. Retrieved 11 October 2017. ^ "Tambora". Volcano Discovery. 29 May 2016. Archived from the original on 20 December 2016. Retrieved 20 December 2016. ^ Bressan, David (31 August 2016). "The Eruption of Krakatoa Was the First Global Catastrophe". Forbes. Archived from the original on 2 September 2016. Retrieved 2 September 2017. ^ Mumtazah, Hani (22 May 2003). "Indonesia's Natural Wealth: The Right of a Nation and Her People". Islam Online. Archived from the original on 17 October 2006. Retrieved 17 October 2006. ^ Whitten, T.; Henderson, G.; Mustafa, M. (1996). The Ecology of Sulawesi. Hong Kong: Periplus Editions Ltd. ISBN 978-962-593-075-6. ; Monk, K.A. ; Fretes, Y.; Reksodiharjo-Lilley, G. (1996). The Ecology of Nusa Tenggara and Maluku. Hong Kong: Periplus Editions Ltd. ISBN 978-962-593-076-3. ^ "Indonesia". InterKnowledge Corp. 6 October 2006. Archived from the original on 15 October 2006. Retrieved 15 October 2006. ^ "Indonesia" (in Norwegian). United Nations Association of Norway. 18 December 2014. Retrieved 19 December 2017. ^ Lambertini, Marco (10 April 2011). "A Naturalist's Guide to the Tropics, excerpt". The University of Chicago Press. Archived from the original on 5 February 2017. Retrieved 5 February 2017. ^ Tamindael, Otniel (17 May 2011). "Coral reef destruction spells humanitarian disaster". Antara News. Archived from the original on 25 May 2011. Retrieved 25 May 2011. ^ a b Severin, Tim (1997). The Spice Island Voyage: In Search of Wallace. Great Britain: Abacus Travel. ISBN 978-0-349-11040-0. ^ Wallace, A.R. (2000) . The Malay Archipelago. Periplus Editions. ISBN 978-962-593-645-1. ^ a b Miller, Jason R. (14 August 2007). "Deforestation in Indonesia and the Orangutan Population". TED Case Studies. Archived from the original on 11 August 2007. Retrieved 11 August 2007. ^ "2018 Environmental Performance Index" (PDF). Yale University. 2018. Archived (PDF) from the original on 26 August 2018. Retrieved 26 August 2018. ^ McClanahan, Paige (11 September 2013). "Can Indonesia increase palm oil output without destroying its forest?". The Guardian. Archived from the original on 17 September 2013. Retrieved 17 September 2013. ^ Colchester, Marcus; Jiwan, Normal; Andiko, Martua Sirait; Firdaus, Asup Y.; Surambo, A.; Pane, Herbert (26 March 2012). "Palm Oil and Land Acquisition in Indonesia: Implications for Local Communities and Indigenous People" (PDF). Archived from the original (PDF) on 31 May 2012. Retrieved 31 May 2012. ^ Chrysolite, Hanny; Juliane, Reidinar; Chitra, Josefhine; Ge, Mengpin (4 October 2017). "Evaluating Indonesia's Progress on its Climate Commitments". World Resources Institute. Archived from the original on 5 October 2017. Retrieved 26 August 2018. ^ BirdLife International (2016). "Leucopsar rothschildi". IUCN Red List of Threatened Species. 2016: e.T22710912A94267053. doi:10.2305/IUCN.UK.2016-3.RLTS.T22710912A94267053.en. ^ "Extinction crisis escalates: Red List shows apes, corals, vultures, dolphins all in danger". International Union for Conservation of Nature. 12 September 2007. Archived from the original on 16 October 2016. Retrieved 16 October 2016. ^ van Strien, N.J.; Steinmetz, R.; Manullang, B.; Sectionov, Han; K.H., Isnan; W., Rookmaaker; K., Sumardja; E., Khan; M.K.M. & Ellis, S. (2008). "Rhinoceros sondaicus". The IUCN Red List of Threatened Species. 2008: e.T19495A8925965. doi:10.2305/IUCN.UK.2008.RLTS.T19495A8925965.en. Retrieved 23 October 2018. ^ a b "Climate Impact Map". Climate Impact Lab. Retrieved 18 November 2018. ^ a b c d Case M, Ardiansyah F, Spector E (14 November 2007). "Climate Change in Indonesia: Implications for Humans and Nature" (PDF). WWF. Archived (PDF) from the original on 19 February 2018. Retrieved 18 November 2018. ^ Surjadi, Harry; Saturi, Sapariah; Ismail, Merah; Priadi, Indoarto (11 November 2017). "Climate change: Is the media failing us?". Al Jazeera. Archived from the original on 26 September 2018. Retrieved 18 November 2017. ^ Lin, Mayuri Mei; Hidayat, Rafki (13 August 2018). "Jakarta, the fastest-sinking city in the world". BBC. Archived from the original on 18 October 2018. Retrieved 19 November 2018. ^ "Indonesia: Climate Risk and Adaptation Country Profile" (PDF). World Bank. April 2011. Archived (PDF) from the original on 6 December 2017. Retrieved 18 November 2018. ^ a b c Dwi Harijanti, Susi; Lindsey, Tim (1 January 2006). "Indonesia: General elections test the amended Constitution and the new Constitutional Court". International Journal of Constitutional Law. 4 (1): 138–150. doi:10.1093/icon/moi055. Archived from the original on 14 January 2018. Retrieved 14 January 2018. ^ (2002), The fourth Amendment of 1945 Indonesia Constitution, Chapter III – The Executive Power, Article 7. ^ Chapter II, Article 3, 3rd Clause of the 1945 Constitution. ^ a b c "The 1945 Constitution of the Republic of Indonesia" (PDF). International Labour Organization. Archived (PDF) from the original on 11 October 2017. Retrieved 11 October 2017. ^ a b Pope, Timothy; Longmuir, Scott (3 April 2014). "Indonesia's parliamentary and presidential elections: How does the system work?". ABC News. Archived from the original on 12 May 2017. Retrieved 12 May 2017. ^ Chapter VIIA, Article 22D of the 1945 Constitution. ^ Cammack, Mark E.; Feener, R. Michael (January 2012). "The Islamic Legal System in Indonesia" (PDF). Pacific Rim Law & Policy Journal. Archived (PDF) from the original on 1 July 2017. Retrieved 1 July 2017. ^ Cochrane, Joe (15 March 2014). "Governor of Jakarta Receives His Party's Nod for President". The New York Times. Archived from the original on 3 February 2017. Retrieved 3 February 2017. ^ "KPU Successfully Set and Authorize Pileg Results On Time". Indonesia Election Portal. 10 May 2014. Archived from the original on 23 October 2016. Retrieved 23 October 2016. ^ Maboy, Olasri (4 August 2017). "New election bill, new hope for democracy". The Jakarta Post. Archived from the original on 10 October 2017. Retrieved 5 October 2018. ^ "House Agrees on Creation of Indonesia's 34th Province: 'North Kalimantan'". The Jakarta Globe. 22 October 2012. Archived from the original on 16 August 2017. Retrieved 16 August 2017. ^ Simanjuntak, Hotli (18 August 2008). "Finally, Aceh local parties to take part in general election". The Jakarta Post. Archived from the original on 16 August 2017. Retrieved 16 August 2017. ^ Michelle Ann Miller (2004). "The Nanggroe Aceh Darussalam law: a serious response to Acehnese separatism?". Asian Ethnicity. 5 (3): 333–351. doi:10.1080/1463136042000259789. ^ "The last frontier". The Economist. 30 June 2012. Retrieved 20 September 2018. ^ "Missions". Ministry of Foreign Affairs – Republic of Indonesia. Retrieved 8 September 2018. ^ Péter, Klemensits; Márton, Fenyő (16 August 2017). "The Foreign Policy of Indonesia In Light of President Jokowi's "Visi-Misi" Program" (PDF). Pázmány Péter Catholic University. Archived (PDF) from the original on 10 October 2017. Retrieved 10 October 2017. ^ "Indonesia – Foreign Policy". U.S. Library of Congress. Archived from the original on 27 September 2006. Retrieved 27 September 2006. ^ "U.S. Relations With Indonesia". U.S. Department of State. 17 January 2017. Retrieved 15 February 2017. ^ Kristof, Nicholas D. (4 July 1990). "China and Indonesia Sign a Pact To Restore Ties Severed in 60's". The New York Times. Archived from the original on 27 April 2018. Retrieved 27 April 2018. ^ Muraviev, Alexey; Brown, Colin (December 2008). "Strategic Realignment or Déjà vu? Russia-Indonesia Defence Cooperation in the Twenty-First Century" (PDF). Australian National University. Archived (PDF) from the original on 27 December 2016. Retrieved 27 December 2016. ^ Muhammad Zulfikar Rakhmat (11 March 2015). "The Quiet Growth in Indonesia-Israel Relations". The Diplomat. Archived from the original on 13 June 2018. Retrieved 8 September 2018. ^ Roberts, C.; Habir, A.; Sebastian, L. (25 February 2015). Indonesia's Ascent: Power, Leadership, and the Regional Order. ISBN 9781137397416. Retrieved 19 December 2017. ^ Jensen, Fergus; Asmarini, Wilda. "Net oil importer Indonesia leaves producer club OPEC, again". Reuters. Archived from the original on 1 December 2016. Retrieved 1 December 2016. ^ Gutierrez, Natashya (22 August 2016). "What happened when Indonesia 'withdrew' from the United Nations". Rappler. Archived from the original on 1 November 2016. Retrieved 8 September 2018. ^ "International Cooperation and Development". European Commission. 17 January 2018. Retrieved 17 January 2018. ^ "Indonesia" (PDF). Development Initiatives. 2013. Archived (PDF) from the original on 7 January 2014. Retrieved 28 July 2018. ^ Pierre van der Eng (2 December 2017). "Why does Indonesia seem to prefer foreign aid from China?". East Asia Forum. Archived from the original on 22 July 2018. Retrieved 28 July 2018. ^ Troath, Sian (28 February 2018). "Shrugging Indonesia's inferiority complex". Lowy Institute. Archived from the original on 8 September 2018. Retrieved 8 September 2018. ^ Chew, Amy (7 July 2002). "Indonesia military regains ground". CNN. Archived from the original on 14 November 2017. Retrieved 14 November 2017. ^ "Indonesia: Military expenditure (% of GDP)". World Bank. 2017. Retrieved 26 November 2018. ^ Jessica Vincentia Marpaung (17 June 2016). "TNI's Gold Mine: Corruption and Military-Owned Businesses in Indonesia". The Global Anti Corruption Blog. Archived from the original on 18 December 2017. Retrieved 18 December 2017. ^ Beets, Benjamin H. (2015). "The Political Influence of the Military Before and After Democratic Transition: Experiences from Indonesia – An Assessment on Myanmar" (PDF). Victoria University of Wellington. Retrieved 30 July 2018. ^ "Indonesia Faces 3 Separatist Movements". Los Angeles Times. 9 September 1990. Archived from the original on 10 October 2017. Retrieved 10 October 2017. ^ Friend 2003, pp. 270–273, 477–480. ^ "Indonesia flashpoints: Aceh". BBC. 29 December 2005. Archived from the original on 22 August 2006. Retrieved 22 August 2006. ^ "Papua: Answer to Frequently Asked Questions" (PDF). International Crisis Group. 5 September 2006. Archived from the original (PDF) on 18 September 2006. Retrieved 18 September 2006. ^ Indonesia (1977), p. 39. ^ Budiardjo and Liong, p. 22. ^ "Economy of Indonesia". Indonesia Invesments. Archived from the original on 4 May 2017. Retrieved 4 May 2017. ^ "What is the G20?". G20. 2017. Retrieved 20 December 2017. ^ "Policy Review: Is the Indonesian Government Debt still in a 'Safe Zone'?". The Insider Stories. 21 February 2018. Archived from the original on 30 August 2018. Retrieved 30 August 2018. ^ "Indonesia: Share of economic sectors in the gross domestic product (GDP) from 2007 to 2017". Statista. June 2018. Retrieved 26 November 2018. ^ "Indonesia: Distribution of employment by economic sector from 2007 to 2017". Statista. June 2018. Retrieved 26 November 2018. ^ a b c Elias, Stephen; Noone, Clare (December 2011). "The Growth and Development of the Indonesian Economy" (PDF). Reserve Bank of Australia. Archived (PDF) from the original on 27 December 2016. Retrieved 27 December 2016. ^ "Indonesia – Poverty and Wealth". Encyclopedia of the Nations. Archived from the original on 14 July 2011. Retrieved 14 July 2011. ^ Temple, Jonathan (15 August 2001). "Growing into trouble: Indonesia after 1966" (PDF). University of Bristol. Archived (PDF) from the original on 27 December 2016. Retrieved 27 December 2016. ^ van der Eng, Pierre (4 February 2002). "Indonesia's growth experience in the 20th century: Evidence, queries, guesses" (PDF). Australian National University. Archived (PDF) from the original on 10 October 2017. Retrieved 10 October 2017. ^ "World Economic Outlook Database: Report for Selected Countries and Subjects – Indonesia". International Monetary Fund. October 2017. Retrieved 9 January 2018. ^ "IMF Survey: Indonesia's Choice of Policy Mix Critical to Ongoing Growth". International Monetary Fund. 28 July 2009. Archived from the original on 5 February 2017. Retrieved 5 February 2017. ^ "Fitch Upgrades Indonesia's Rating to Investment Grade". Jakarta Globe. 15 December 2011. Archived from the original on 8 January 2012. Retrieved 8 February 2012. ^ Roughneen, Simon (23 January 2018). "Nearly one billion Asians in vulnerable jobs, says ILO". Nikkei Asian Review. Archived from the original on 30 August 2018. Retrieved 30 August 2018. ^ "Indonesia to strive for poverty rate below 10 percent". The Jakarta Post. 4 January 2018. Archived from the original on 6 February 2018. Retrieved 30 August 2018. ^ Aisyah, Rachmadea (15 January 2019). "Indonesia posts historic $8.57 billion deficit". The Jakarta Post. Archived from the original on 16 January 2019. Retrieved 16 January 2019. ^ Legge, John D. (April 1990). "Review: Indonesia's Diversity Revisited". Indonesia. 49 (49): 127–131. doi:10.2307/3351057. hdl:1813/53928. JSTOR 3351057. ^ del Olmo, Esmeralda (6 November 2017). "Indonesian Transportation Sector Report 2017/2018". EMIS. Archived from the original on 24 October 2018. Retrieved 24 October 2018. ^ "Length of Road by Surface, 1957–2015 (Km)" (in Indonesian). BPS. Retrieved 20 December 2017. ^ "Koridor" (in Indonesian). TransJakarta. Retrieved 15 August 2017. ^ "MRT and LRT, Jakarta's New Rapid Transportation: Coming Soon". Indo Indians. 25 September 2017. Archived from the original on 17 January 2018. Retrieved 17 January 2018. ^ Alexander, Hilda B. (22 October 2016). "Palembang LRT to begin operation in June 2018" (in Indonesian). Kompas. Archived from the original on 29 October 2016. Retrieved 29 October 2016. ^ "South-east Asia's first high-speed rail in Indonesia ready for construction: China Railway Corp". The Straits Times. 2 July 2018. Archived from the original on 11 July 2018. Retrieved 26 September 2018. ^ "Soekarno-Hatta world's 17th busiest airport". The Jakarta Post. Archived from the original on 11 April 2018. Retrieved 11 April 2018. ^ "The 13,466-island problem". The Economist. 27 February 2016. Retrieved 16 June 2017. ^ "Overview: Indonesia". U.S. Energy Information Administration. 7 October 2015. Retrieved 26 November 2018. ^ Budiman, Arief; Das, Kaushik; Mohammad, Azam; Tee Tan, Khoon; Tonby, Oliver (September 2014). "Ten ideas to reshape Indonesia's energy sector". McKinsey&Company. Archived from the original on 30 March 2015. Retrieved 30 March 2015. ^ a b Dolf Gielen, Deger Saygin and Jasper Rigter (March 2017). "Renewable Energy Prospects: Indonesia". International Renewable Energy Agency. Archived from the original on 12 November 2017. Retrieved 13 September 2018. ^ "Power in Indonesia 2017" (PDF). PwC. November 2017. Archived (PDF) from the original on 13 September 2018. Retrieved 13 September 2018. ^ "Statistik Ketenagalistrikan" (PDF) (in Indonesian). Kementerian ESDM. September 2016. Archived from the original (PDF) on 15 August 2017. Retrieved 15 August 2017. ^ Dr. Coyne & Bellier (9 October 2007). "Jatiluhur in Indonesia" (in French). Planete-TP. Archived from the original on 9 November 2013. Retrieved 9 November 2013. ^ "Indonesia seeking greater funding for R&D". Oxford Business Group. 29 August 2017. Archived from the original on 14 November 2017. Retrieved 25 August 2018. ^ Kasten, Michael. "History of the Indonesian Pinisi". Archived from the original on 9 December 2016. Retrieved 9 December 2016. ^ Sertori, Trisha (11 December 2014). "Man of 1000 shoulders". The Jakarta Post. Archived from the original on 20 March 2015. Retrieved 20 March 2015. ^ Rika Stevani, Louis (4 February 2017). "INKA to Manufacture Trains for Export to Bangladesh, Sri Lanka". Tempo. Archived from the original on 15 January 2018. Retrieved 15 January 2018. ^ Dwi Sutianto, Feby (5 February 2016). "PTDI Ekspor 40 Unit Pesawat, Terlaris CN235" (in Indonesian). detikFinance. Archived from the original on 15 August 2017. Retrieved 15 August 2017. ^ "Habibie receives honorary doctorate". The Jakarta Post. 30 January 2010. Archived from the original on 5 March 2016. Retrieved 5 March 2016. ^ "KF-X Fighter: Korea's Future Homegrown Jet". Defense Industry Daily. 21 November 2017. Archived from the original on 23 November 2017. Retrieved 23 November 2017. ^ Mcelheny, Victor K. (8 July 1976). "Indonesian Satellite to Be Launched". The New York Times. Archived from the original on 2 August 2018. Retrieved 2 August 2018. ^ "Planning and Development of Indonesia's Domestic Communications Satellite System PALAPA". Online Journal of Space Communication. 2005. Archived from the original on 18 May 2015. Retrieved 18 May 2015. ^ "Satellites by countries and organizations: Indonesia". N2YO. Retrieved 28 July 2018. ^ Faris Sabilar Rusydi (17 June 2016). "Lapan Target Luncurkan Roket Pengorbit Satelit Pada 2040" (in Indonesian). National Institute of Aeronautics and Space (LAPAN). Archived from the original on 16 August 2017. Retrieved 16 August 2016. ^ Elliott, Mark (2003). Indonesia. Melbourne: Lonely Planet Publications Pty Ltd. pp. 211–215. ISBN 978-1-74059-154-6. ^ a b c "Indonesia" (PDF). World Economic Forum. 2017. Archived (PDF) from the original on 29 May 2018. Retrieved 29 June 2017. ^ "BPS records 14.04 million tourist arrivals in 2017". The Jakarta Post. 1 February 2018. Archived from the original on 4 February 2018. Retrieved 5 October 2018. ^ Erwida, Maulia (6 January 2011). "Tourism Ministry set to launch 'Wonderful Indonesia' campaign". The Jakarta Post. Archived from the original on 12 March 2014. Retrieved 12 March 2014. ^ Doubilet, David (September 2007). "Indonesia Undersea". National Geographic. Archived from the original on 6 August 2009. Retrieved 6 August 2009. ^ "Indonesia – Properties inscribed on the World Heritage List". UNESCO. Retrieved 27 November 2016. ^ "Fifty years needed to bring population growth to zero". Waspada Online. 19 March 2011. Archived from the original on 10 May 2011. Retrieved 10 May 2011. ^ "Census 2010" (PDF) (in Indonesian). BPS. August 2010. Archived from the original (PDF) on 13 November 2010. Retrieved 13 November 2010. 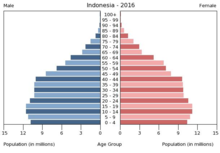 ^ "Indonesia Population Projection" (PDF) (in Indonesian). BPS. Retrieved 30 December 2016. ^ "BBC: First contact with isolated tribes?". Survival International. 25 January 2007. Archived from the original on 30 July 2017. Retrieved 30 July 2017. ^ Nitisastro, Widjojo (2006). Population Trends in Indonesia. Equinox Publishing. p. 268. ISBN 9789793780436. Retrieved 5 September 2015 – via Google Books. ^ "World Population Prospect: 2017 Revision" (PDF). United Nations Department of Economics and Social Affairs – Population Division. 21 June 2017. Archived (PDF) from the original on 20 December 2017. Retrieved 20 December 2017. ^ Krisetya, Beltsazar (14 September 2016). "Tapping the Indonesian Diaspora Potential". Forum for International Studies. Archived from the original on 20 December 2017. Retrieved 20 December 2017. ^ a b "An Overview of Indonesia". Living in Indonesia: A Site for Expatriates. Archived from the original on 14 November 2017. Retrieved 14 November 2017. ^ Witton 2003, pp. 139, 181, 251, 435. ^ Dawson, B.; Gillow, J. (1994). The Traditional Architecture of Indonesia. London: Thames and Hudson Ltd. p. 7. ISBN 978-0-500-34132-2. ^ Ricklefs 1991, p. 256. ^ "The History of Indonesian". Language Translation, Inc. Archived from the original on 4 March 2016. Retrieved 12 January 2016. ^ Sneddon, James N. (April 2013). "The Indonesian Language: Its History and Role in Modern Society". University of South Wales Press Ltd. Archived from the original on 29 July 2017. Retrieved 20 January 2018. ^ Anwar, Khaidir (1976). "Minangkabau, Background of the main pioneers of modern standard Malay in Indonesia". Retrieved 9 June 2017. ^ Amerl, Ivana (May 2006). "Language interference: Indonesian and English". MED Magazine. Archived from the original on 29 July 2017. Retrieved 20 January 2018. ^ van Nimwegen, Nico (2002). "The Demographic History of the Dutch in the East Indies" (PDF). Nederlands Interdisciplinair Demografisch Instituut. Archived from the original (PDF) on 23 July 2011. Retrieved 23 July 2011. ^ Baker (1998), p. 202. ^ Ammon (2005), p. 2017. ^ Chapter XA, Article 28E, 1st Clause of the 1945 Constitution. ^ Shah, Dian A. H. (2017). Constitutions, Religion and Politics in Asia: Indonesia, Malaysia and Sri Lanka. Cambridge: Cambridge University Press. ISBN 978-1-107-18334-6. ^ a b c Marshall, Paul (2018). "The Ambiguities of Religious Freedom in Indonesia". The Review of Faith & International Affairs. 16 (1): 85–96. ^ "Sunni and Shia Muslims". Pew Research Center. 27 January 2011. Archived from the original on 6 May 2017. Retrieved 6 May 2017. ^ Bureau of Democracy, Human Rights and Labor (2017). "2016 Indonesia International Religious Freedom Report" (PDF). U.S. Department of State. Archived (PDF) from the original on 19 December 2017. Retrieved 19 December 2017. ^ Oey, Eric (1997). Bali (3rd ed.). Singapore: Periplus Editions. ISBN 978-962-593-028-2. ^ Suryadinata, Leo, ed. (2008). Ethnic Chinese in Contemporary Indonesia. ISBN 9789812308351. ^ "How religious commitment varies by country among people of all ages". Pew Research Center. 13 June 2018. Archived from the original on 27 August 2018. Retrieved 23 November 2018. ^ Pearce, Jonathan MS (28 October 2018). "Religion in Indonesia: An Insight". Patheos. Archived from the original on 28 October 2018. Retrieved 23 November 2018. ^ "Indonesian Holidays". Living in Indonesia: A Site for Expatriates. 4 February 2019. Retrieved 4 April 2019. ^ a b Ooi, Keat Gin, ed. (2004). Southeast Asia: A historical encyclopedia, from Angkor Wat to East Timor (3 volume set). ABC-CLIO. p. 177. ISBN 978-1-57607-770-2. ^ Magnis-Suseno, F. 1981, Javanese Ethics and World-View: The Javanese Idea of the Good Life, PT Gramedia Pustaka Utama, Jakarta, 1997, pp. 15–18 ISBN 979-605-406-X, "2003 International Religious Freedom Report". U.S. Department of State. 2003. Archived from the original on 13 January 2012. Retrieved 13 January 2012. ^ Darsa, Undang A. 2004. "Kropak 406; Carita Parahyangan dan Fragmen Carita Parahyangan", Makalah disampaikan dalam Kegiatan Bedah Naskah Kuna yang diselenggarakan oleh Balai Pengelolaan Museum Negeri Sri Baduga. Bandung-Jatinangor: Fakultas Sastra Universitas Padjadjaran: hlm. 1–23. ^ "Buddhism in Indonesia". Buddha Dharma Education Association. Buddha Dharma Education Association. 2005. Retrieved 3 October 2006. ^ "Indonesia – Bhineka Tunggal Ika". Centre Universitaire d'Informatique. Archived from the original on 14 September 2006. Retrieved 20 October 2006. ^ Ricklefs 1991, pp. 25, 26, 28. ^ "About St Francis Xavier". Catholic Archdiocese of Sydney. Archived from the original on 16 November 2012. Retrieved 5 July 2018. ^ Barnes, R.H. (2008). "Raja Lorenzo II: A Catholic kingdom in the Dutch East Indies" (PDF). University of Oxford. Archived (PDF) from the original on 20 August 2017. Retrieved 20 August 2017. ^ Ricklefs 1991, pp. 28, 62. ^ Vickers 2005, p. 22. ^ Goh, Robbie B.H. (2005). Christianity in Southeast Asia. Institute of Southeast Asian Studies. p. 80. ISBN 978-981-230-297-7. ^ "Indonesia – Asia". Reformed Online. Archived from the original on 5 December 2006. Retrieved 5 December 2006. ^ al-Samarrai, Samer; Cerdan-Infantes, Pedro (9 March 2013). "Awakening Indonesia's Golden Generation: Extending Compulsory Education from 9 to 12 Years". The World Bank Blog. Archived from the original on 10 October 2017. Retrieved 10 October 2017. ^ Tan, Charlene (2014). "Educative Tradition and Islamic Schools in Indonesia" (PDF). Nanyang Technological University. Archived (PDF) from the original on 27 March 2016. Retrieved 27 March 2016. ^ "Indonesia: Education Expenditures". UNESCO Institute for Statistics. Retrieved 21 August 2017. ^ a b "Is Indonesia Ready for International Branch Campuses?". Inside Higher Ed. 29 May 2018. Archived from the original on 30 May 2018. Retrieved 18 November 2018. ^ "Andalas University". Global Business Guide Indonesia. Archived from the original on 8 November 2016. Retrieved 8 November 2016. ^ "2018 Health SDG Profile: Indonesia" (PDF). World Health Organization. July 2018. Archived (PDF) from the original on 6 December 2018. Retrieved 10 December 2018. ^ Thabrany, Hasbullah (2 January 2014). "Birth of Indonesia's 'Medicare': Fasten your seatbelts". The Jakarta Post. Archived from the original on 10 January 2014. Retrieved 26 August 2018. ^ "The Republic of Indonesia Health System Review" (PDF). Asia Pacific Observatory on Health Systems and Policies. 2017. Archived (PDF) from the original on 29 March 2017. Retrieved 12 January 2018. ^ Nafsiah Mboi; Indra Murty Surbakti; Indang Trihandini; Iqbal Elyazar; Karen Houston Smith; et al. (2018). "On the road to universal health care in Indonesia, 1990–2016: a systematic analysis for the Global Burden of Disease Study 2016". The Lancet. 392 (10147): 581–591. doi:10.1016/S0140-6736(18)30595-6. PMC 6099123. PMID 29961639. ^ Tadjoeddin, Mohammad Zulfan; Chowdury, Anis; Murshed, Syed Mansoob (October 2010). "Routine Violence in Java, Indonesia: Neo-Malthusian and Social Justice Perspectives" (PDF). Archived (PDF) from the original on 10 October 2017. Retrieved 10 October 2017. ^ Upton, Stuart (January 2009). "The impact of migration on the people of Papua, Indonesia: A historical demographic analysis" (PDF). University of New South Wales. Archived (PDF) from the original on 10 May 2017. Retrieved 10 May 2017. ^ "Indonesia's Rising Divide". World Bank. 7 December 2015. Archived from the original on 14 December 2016. Retrieved 14 December 2016. ^ "Indonesia: The population of Chinese Indonesians and Chinese Christians in the Sulawesi provinces and the cities of Medan and Banda Aceh; incidents of violence and state protection available" (PDF). Immigration and Refugee Board of Canada. 17 March 2010. Archived (PDF) from the original on 10 October 2017. Retrieved 10 October 2017. ^ Setijadi, Charlotte (17 March 2016). "Ethnic Chinese in Contemporary Indonesia: Changing Identity Politics and the Paradox of Sinification". ISEAS Perspective. 12 (2016). ISSN 2335-6677. ^ a b Harvey, Adam (7 February 2018). "UN rights chief warns 'intolerance' and political extremism making inroads in Indonesia". ABC News. Archived from the original on 10 February 2018. Retrieved 21 April 2018. ^ Knight, Kyle (27 January 2016). "Dispatches: LGBT Backlash in Indonesia". Human Rights Watch. Archived from the original on 31 January 2017. Retrieved 31 January 2017. ^ "Indonesia's Aceh: Two gay men sentenced to 85 lashes". BBC. 17 May 2017. Archived from the original on 23 August 2017. Retrieved 7 April 2018. ^ a b Forshee, Jill (2006). "Culture and Customs of Indonesia" (PDF). Greenwood Press. Archived from the original (PDF) on 10 October 2017. Retrieved 10 October 2017. ^ Henley, David (2015). "Indonesia". The Wiley Blackwell Encyclopedia of Race, Ethnicity, and Nationalism. The Wiley Blackwell Encyclopedia of Race, Ethnicity, and Nationalism. John Wiley & Sons, Inc. pp. 1–7. doi:10.1002/9781118663202.wberen460. ISBN 978-1-118-66320-2. ^ "Indonesia – Intangible heritage, cultural sector". UNESCO. Retrieved 21 December 2017. ^ "Indonesian Arts and Crafts". Living in Indonesia: A site for expats. Archived from the original on 27 December 2016. Retrieved 27 December 2016. ^ a b c Forge, Anthony (1978). "Balinese Traditional Paintings" (PDF). The Australian Museum. Archived (PDF) from the original on 20 December 2016. Retrieved 20 December 2016. ^ "Indonesian Culture; Arts and Tradition". Embassy of Indonesia, Athens. 30 September 2010. Archived from the original on 26 December 2016. Retrieved 26 December 2016. ^ "Borobudur Temple Compounds". UNESCO World Heritage Centre. Archived from the original on 10 October 2017. Retrieved 10 October 2017. ^ Reimar Schefold; P. Nas; Gaudenz Domenig, eds. (2004). Indonesian Houses: Tradition and Transformation in Vernacular Architecture. NUS Press. p. 5. ISBN 978-9971-69-292-6. ^ Harnish, David; Rasmussen, Anne, eds. (2011). Divine Inspirations: Music and Islam in Indonesia. Oxford University Press. ^ "'Keroncong': Freedom music from Portuguese descendants". The Jakarta Post. 16 June 2011. Archived from the original on 23 September 2015. Retrieved 23 September 2015. ^ Heryanto, Ariel (2008). Popular Culture in Indonesia: Fluid Identities in Post-Authoritarian Politics. Routledge. ^ "Indonesia Tourism : The Dance and Theater in the Archipelago". Indonesia Tourism. Archived from the original on 24 November 2010. Retrieved 24 November 2010. ^ Ziyi, Xia (16 November 2011). "Cultural feast at ASEAN Fair". Xinhua. Archived from the original on 19 December 2011. ^ a b Jill Forshee, Culture and customs of Indonesia, Greenwood Publishing Group: 2006: ISBN 0-313-33339-4. 237 pp. 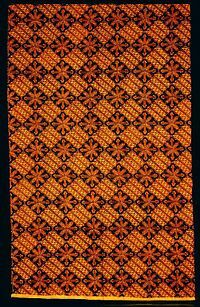 ^ "Indonesian Batik". UNESCO. 2009. Retrieved 12 October 2014. ^ "Traditions, Wayang Wong Priangan: Dance Drama of West Java" (PDF). 2004. Archived (PDF) from the original on 10 October 2017. Retrieved 10 October 2017. ^ José, Maceda. "Southeast Asian arts". Encyclopædia Britannica. Archived from the original on 20 April 2016. Retrieved 20 April 2016. ^ Dewangga, Kusuma (10 November 2013). "Ketoprak: Javanese Folk Art (Part 1 of 2)". Indonesia's Global Portal. Archived from the original on 13 November 2013. Retrieved 13 November 2013. ^ "Indonesia – Theatre and Dance". Encyclopædia Britannica. Archived from the original on 29 June 2016. Retrieved 29 June 2016. ^ Pauka, Kirstin (1998). "The Daughters Take Over? Female Performers in Randai Theatre". The Drama Review. 42 (1): 113–121. doi:10.1162/105420498760308706. ^ a b "Randai (Indonesian folk theater form, uses silat) " MIT Global Shakespeares". ^ Hatley, Barbara (13 November 2017). "Review: Indonesian post-colonial theatre". Inside Indonesia. Archived from the original on 21 December 2017. Retrieved 21 December 2017. ^ Kuhn, Annette (2012). A Dictionary of Film Studies. Oxford/New York: Oxford University Press. p. 229. ISBN 978-0-19-958726-1. ^ a b Sen, Krishna (2006). Giecko, Anne Tereska, ed. Contemporary Asian Cinema, Indonesia: Screening a Nation in the Post-New Order. Oxford/New York: Berg. pp. 96–107. ISBN 978-1-84520-237-8. ^ a b Kristianto, JB (2 July 2005). "The Last 10 Years of Indonesia's Film Industry" (in Indonesian). Kompas. Archived from the original on 13 January 2008. Retrieved 13 October 2008. ^ "The State of Indonesia's Film Industry". Archived from the original on 21 December 1999. ^ Lee, Maggie (21 May 2017). "World Notices Indonesian Film Resurgence". Variety. Archived from the original on 24 November 2017. Retrieved 7 April 2018. ^ Shannon L., Smith; Lloyd Grayson J. (2001). Indonesia Today: Challenges of History. Melbourne: Singapore : Institute of Southeast Asian Studies. ISBN 978-0-7425-1761-5. ^ a b Frederick, William H; Worden, Robert L., eds. (2011). "Indonesia: A country study" (PDF). Library of Congress, Federal Research Division. Archived (PDF) from the original on 15 March 2015. Retrieved 15 March 2015. This article incorporates text from this source, which is in the public domain. ^ "Phoning from home". Globe Asia. 30 August 2010. Archived from the original on 27 March 2011. Retrieved 27 March 2011. ^ Jennifer Yang Hui (2 December 2009). "The Internet in Indonesia: Development and Impact of Radical Websites" (PDF). Routledge. Archived (PDF) from the original on 12 December 2017. Retrieved 12 December 2017. ^ a b Ai Lei Tao (25 April 2016). "Indonesian internet users turn to smartphones to go online". Computer Weekly. Archived from the original on 10 October 2017. Retrieved 10 October 2017. ^ Kure, Emanuel (30 March 2015). "Majority of Indonesian netizens aged 18-25" (in Indonesian). Berita Satu. Archived from the original on 13 October 2017. Retrieved 13 October 2017. ^ Czermak, Karin; Delanghe, Philippe; Weng, Wei. "Preserving intangible cultural heritage in Indonesia" (PDF). SIL International. Archived (PDF) from the original on 9 July 2007. Retrieved 9 July 2007. ^ Seong Chee Tham (1981). Essays on Literature and Society in Southeast Asia: Political and Sociological Perspectives. Kent Ridge, Singapore: Singapore University Press. p. 99. ISBN 978-9971-69-036-6. ^ Taylor 2003, pp. 299–301. ^ Vickers 2005, pp. 3–7. ^ Friend 2003, pp. 74, 180. ^ "Author Pramoedya Ananta Toer dies". BBC. 30 April 2006. Archived from the original on 23 September 2015. Retrieved 23 September 2015. ^ Joy Freidus, Alberta (1977). Sumatran Contributions to the Development of Indonesian Literature, 1920–1942. Asian Studies Program, University of Hawaii. ^ "About Indonesian food". Special Broadcasting Service. 13 May 2015. Archived from the original on 21 May 2015. Retrieved 21 May 2015. ^ a b Natahadibrata, Nadya (10 February 2014). "Celebratory rice cone dish to represent the archipelago". The Jakarta Post. Archived from the original on 14 July 2014. Retrieved 14 July 2014. ^ Witton, Patrick (2002). World Food: Indonesia. Melbourne: Lonely Planet. ISBN 978-1-74059-009-9. ^ Compared to the infused flavors of Vietnamese and Thai food, flavors in Indonesia are kept relatively separate, simple and substantial. Brissendon, Rosemary (2003). South East Asian Food. Melbourne: Hardie Grant Books. ISBN 978-1-74066-013-6. ^ Cheung, Tim (12 July 2017). "Your pick: World's 50 best foods". CNN Travel. Archived from the original on 11 October 2017. Retrieved 11 October 2017. ^ Witton 2003, p. 103. ^ "History of Basketball in Indonesia". National Basketball League Indonesia. Archived from the original on 8 September 2016. Retrieved 8 September 2016. ^ Widazulfia, Fahmiranti (3 May 2015). "7 Boxing World Champions from Indonesia" (in Indonesian). Good News from Indonesia. Archived from the original on 8 July 2015. Retrieved 8 July 2015. ^ Baldwin, Alan (18 February 2016). "Haryanto becomes Indonesia's first F1 driver". Reuters. Archived from the original on 27 December 2016. Retrieved 27 December 2016. Earl, George SW (1850). "On the Leading Characteristics of the Papuan, Australian and Malay-Polynesian Nations". Journal of the Indian Archipelago and Eastern Asia (JIAEA). 4. Frederick, William H.; Worden, Robert L., eds. (2011). Indonesia: A Country Study (6 ed.). Washington, D.C.: Library of Congress, Federal Research Division. ISBN 978-0-8444-0790-6. Ricklefs, Merle Calvin (2001). A history of modern Indonesia since c. 1200 (3 ed.). Basingstoke; Stanford, CA: Palgrave; Stanford University Press. ISBN 978-0-8047-4480-5. Witton, Patrick (2003). Indonesia. Melbourne: Lonely Planet. ISBN 978-1-74059-154-6. "Indonesia". The World Factbook. Central Intelligence Agency.